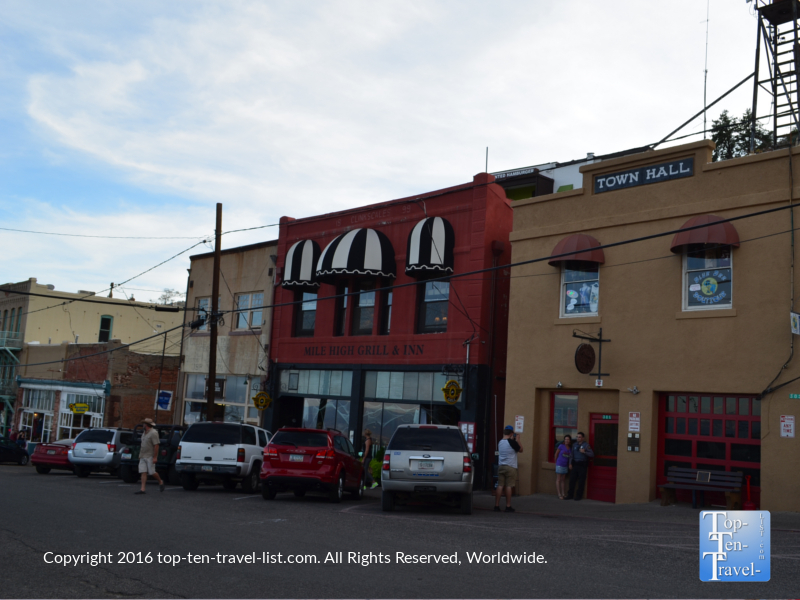 7 Charming Small Towns in Arizona - Top Ten Travel Blog | Our experiences traveling throughout the US. Sprawled out cacti & palm tree loaded metropolises like Phoenix and Tucson usually come to mind first when picturing Arizona. While these 2 massive metros area take up the majority of the Southern portion of the state, there is another side to Arizona that many non-locals are unaware of. 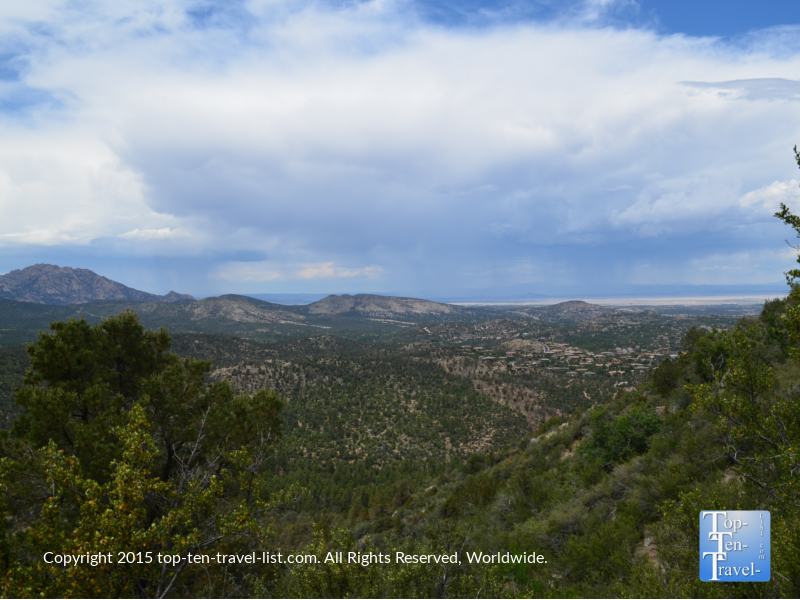 A number of charming small cities & towns comprise the drastically different northern portion of Arizona. These quaint touristy cities are popular vacation destinations (for S. Arizona residents fleeing the heat and tourists alike) and 2nd home residence due to the more attractive seasonal weather conditions and close proximity to many natural wonders. 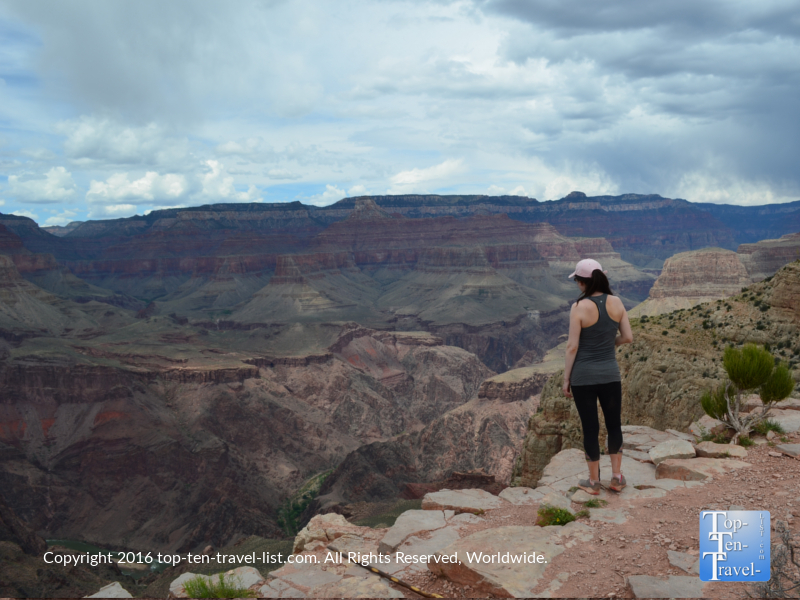 Did you know that you can hike the Grand Canyon? Gorgeous scenery along the South Kalibab trail at the Grand Canyon. 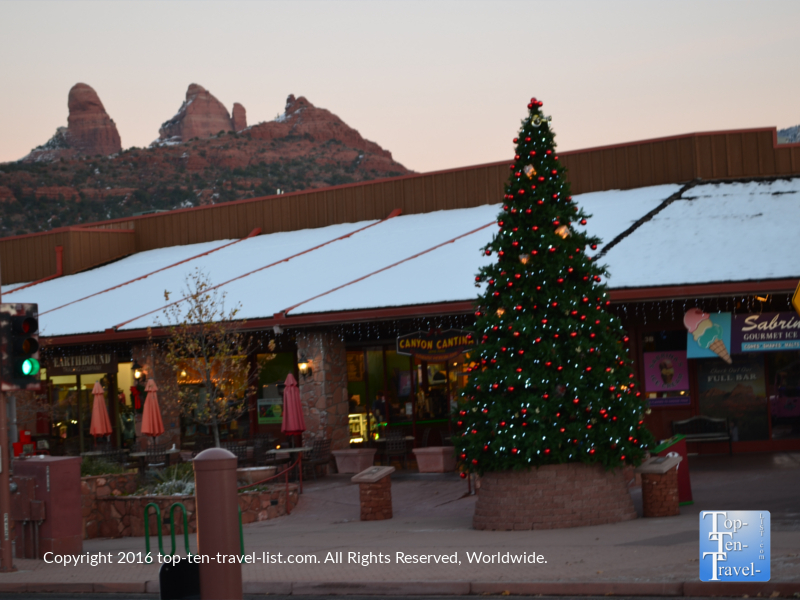 It’s hard to believe that at one time Sedona was a sleepy one stoplight town with nothing more than never ending views of the gorgeous red rocks. 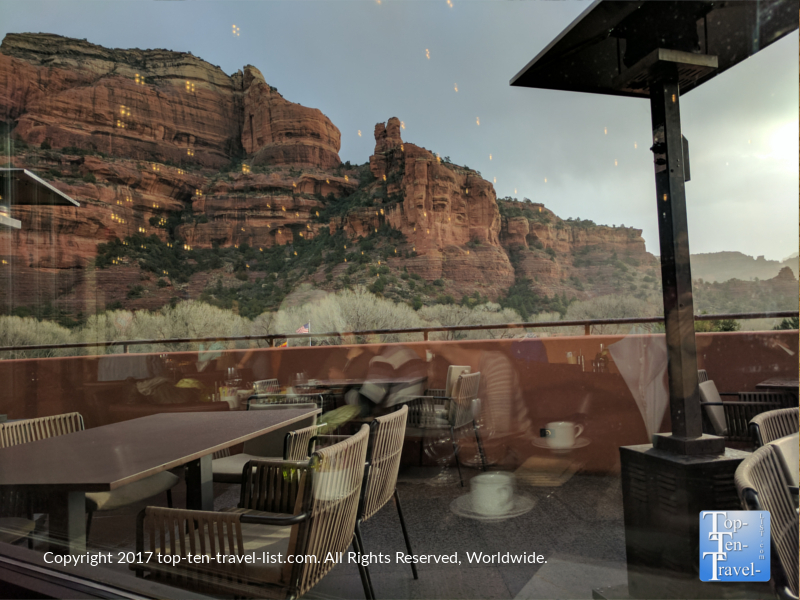 Fast forward a few decades and Sedona, aka as Red Rock Country, has become one of the most popular vacation destination in the Southwest. Many restaurants, resorts, spas, and tour companies have set up shop here, and it seems there is no end in sight. 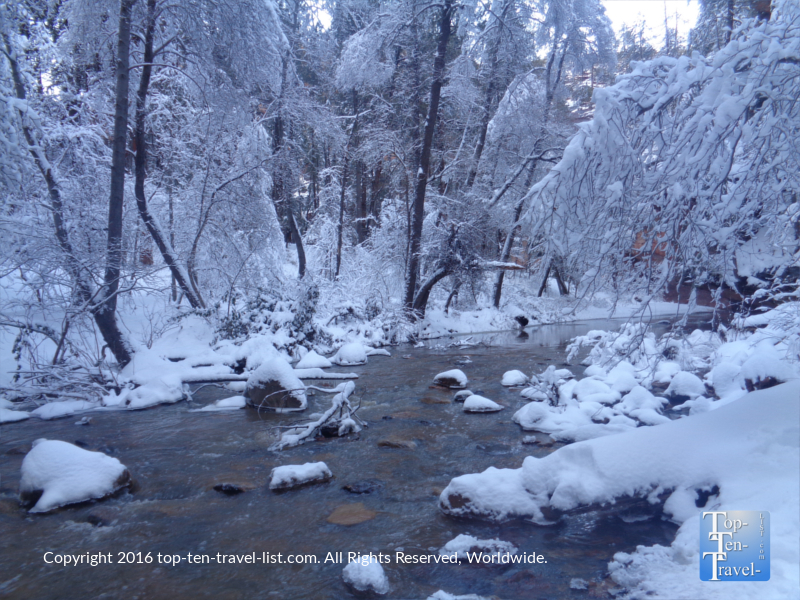 Oak Creek Canyon, the picturesque 14 mile drive between Flagstaff and Sedona, is the 2nd most visited tourist attraction next to the Grand Canyon. 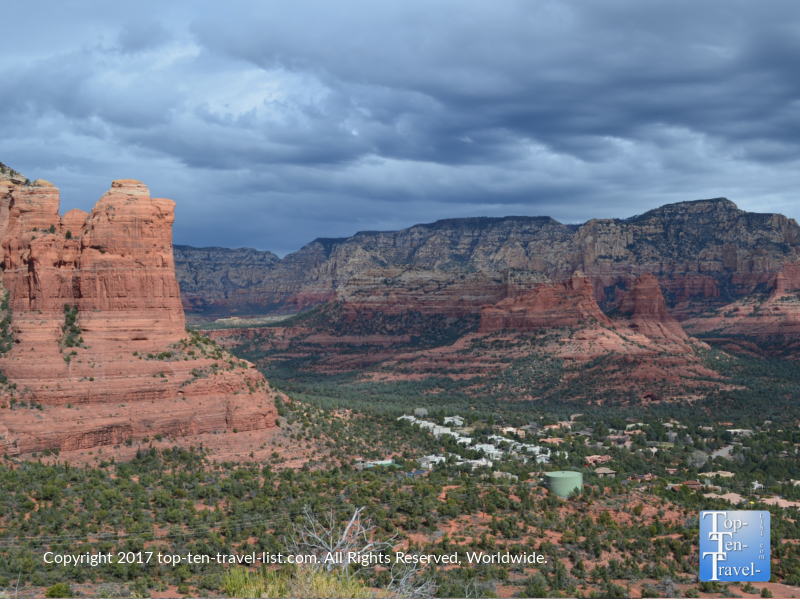 Today, you can do much more in Sedona besides simply hiking. 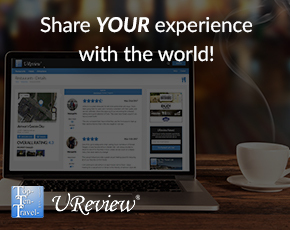 The diverse activities which can comprise your vacation itinerary include jeep and trolley tours, vortex tours, wine tasting, spas, fancy restaurants, and so much more. 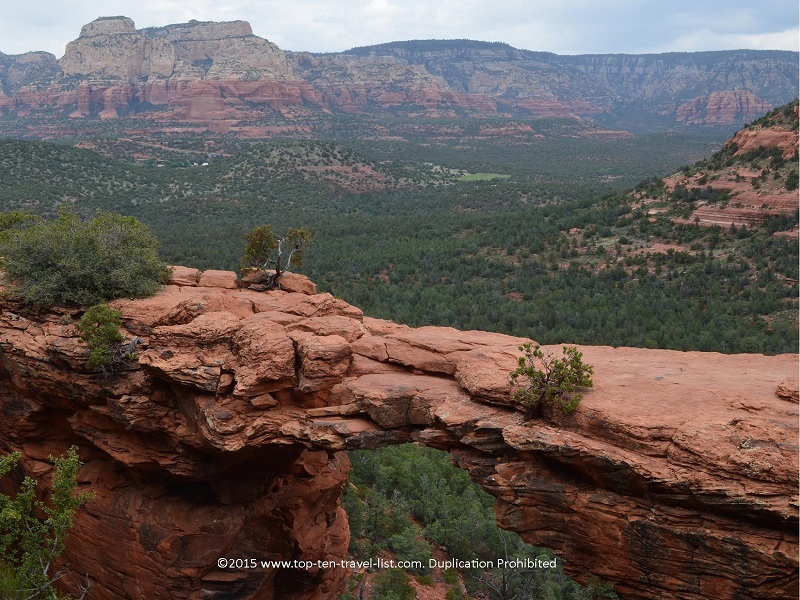 The Devil’s Bridge trail is the standout trail in Sedona. This moderate trails takes you on a scenic adventure to the largest natural sandstone arch in the area! Breathtaking panoramic views from the Teacup/Sugarloaf Summit trail – an easy trail which is really close to town. It’s a must-do! Incredible views from the Doe Mountain trail, a moderately challenging 0.7 mile climb up to the mesa of Doe Mountain. 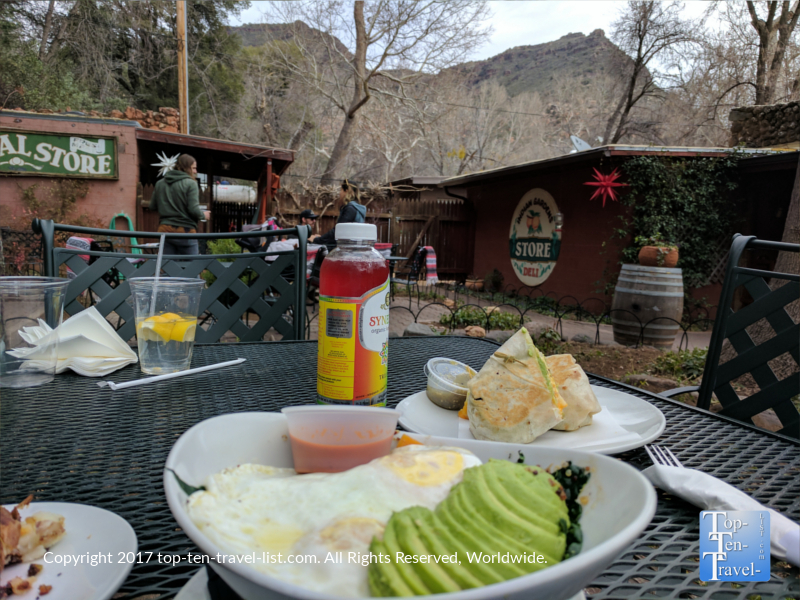 Delicious healthy breakfast fare & great views at Indian Gardens, a quaint cafe along Oak Creek Canyon drive. 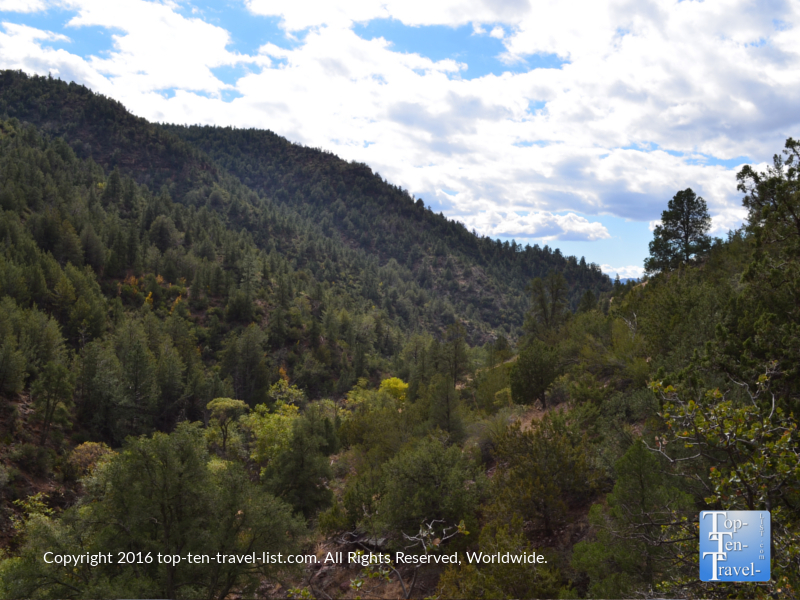 One of many stunning views along Oak Creek Canyon Drive. 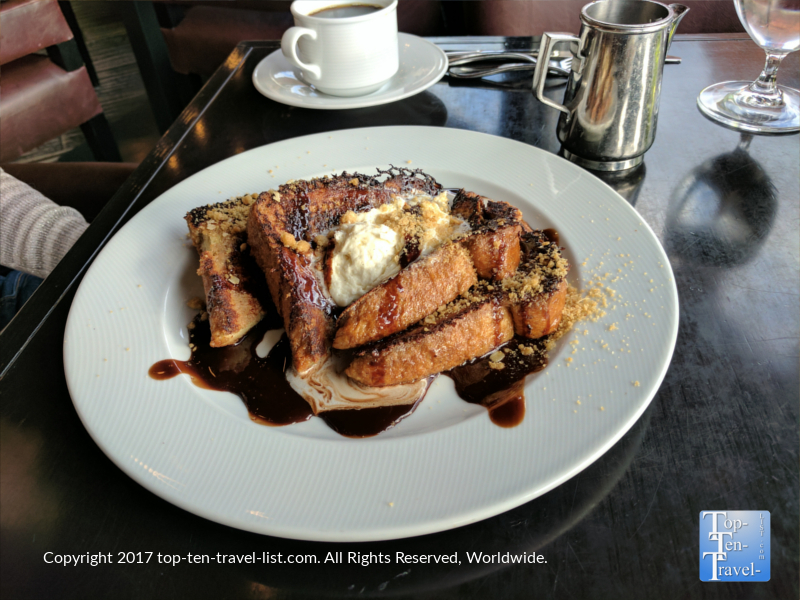 Delicious chocolately mocha French Toast at Che-Ah-Chi at the Enchantment Resort. The best place for breakfast with a view! Dining alongside the red rocks at Che-Ah-Chi at the gorgeous Enchantment Resort. Sedona draws in a really diverse crowd which includes photographers, hikers, nature lovers, couples seeking a romantic vacation, those looking for a little R&R via a luxury spa weekend, and even families seeking a beautiful non traditional vacation that offers something a bit more natural than a typical go-to pick like say Orlando. 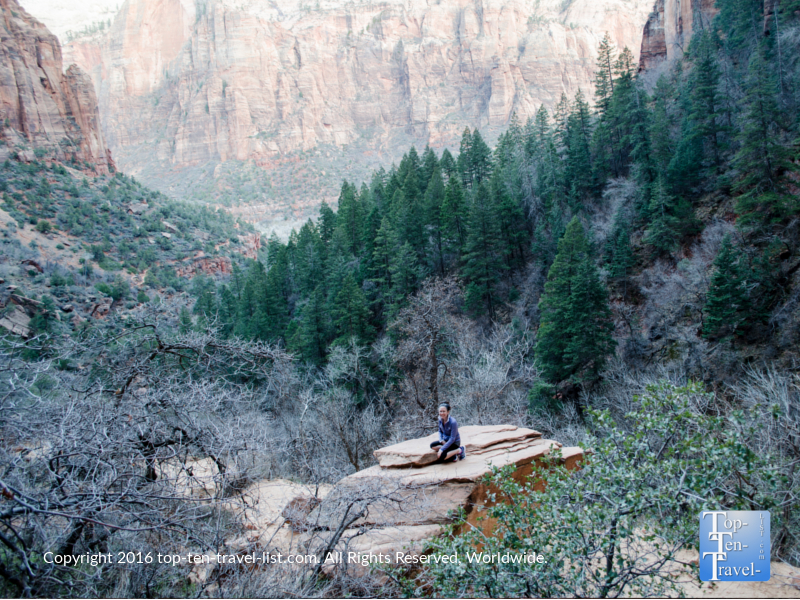 Spiritual seekers and the New age crowd see the area as a place of healing and enlightenment. Sedona has become a spiritual escape with many healing providers in various modalities setting up shop. 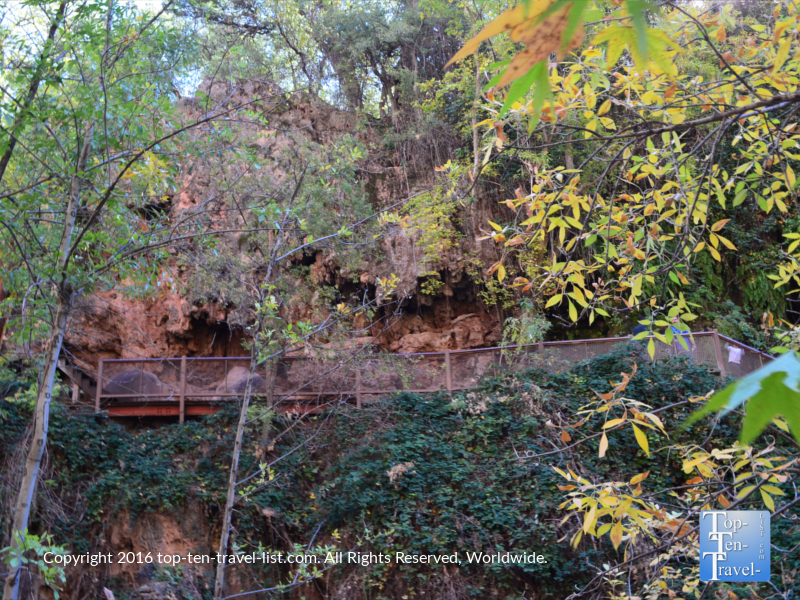 Sedona is also home to a number of vortex sites, which are basically areas of concentrated energy which arise naturally from the Earth, and supposedly balance natural energies & heal anyone who crosses path with these these sacred sites. 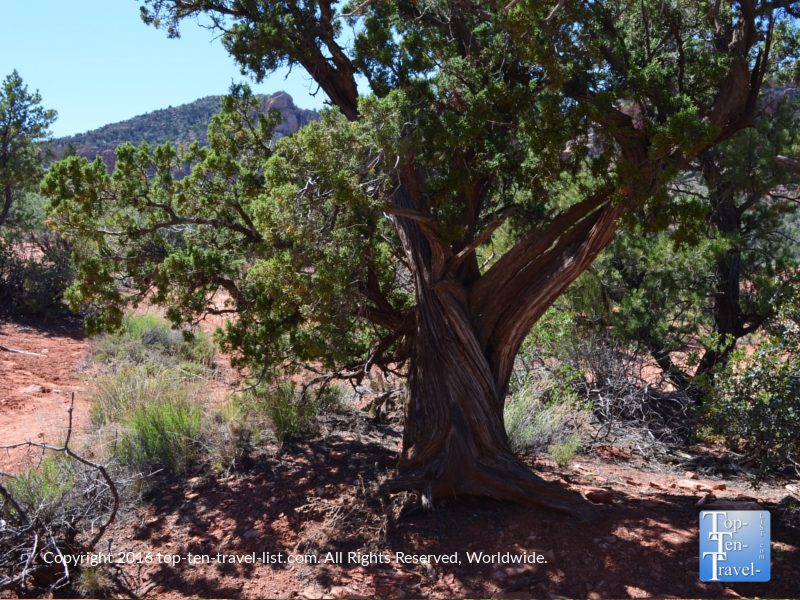 A twisted juniper tree like this one found at Bell Rock (a vortex site) supposedly means there is an intense presence of healing energy in the area. Gorgeous views from the Airport Mesa trail – one of 4 hiking vortexes in the area. 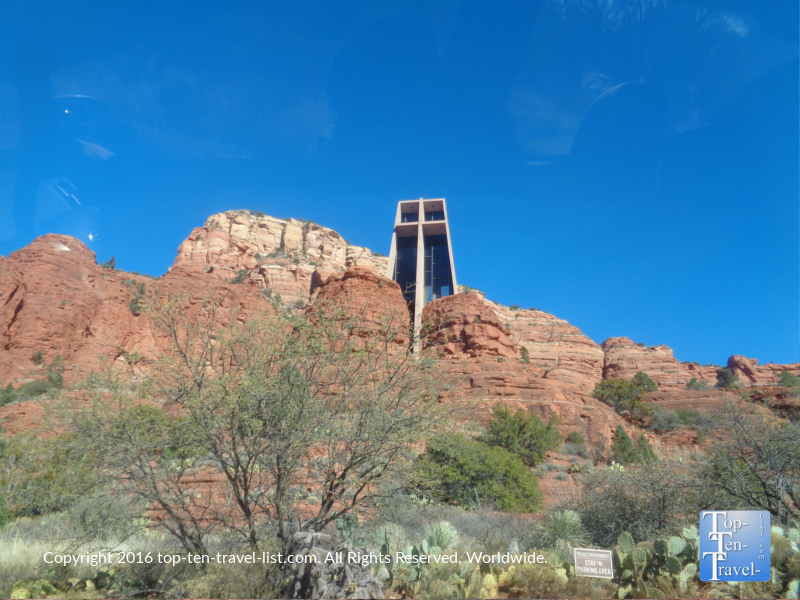 The Chapel of the Holy Cross, a unique architectural wonder built in between 2 red rock formations, is said to be the most powerful vortex site in Sedona. Amazing views from The Chapel of the Holy Cross. Hundreds of miles of trails loaded with the most jaw dropping landscapes you will likely ever lay your eyes upon, makes Sedona the ideal destination for hikers & photographers. However, Sedona is also home to a number of relaxing activities (spas, nice restaurants with views) which compliment an intense day out in nature, therefore, making it a great place for a healthy, yet rejuvenating vacation. 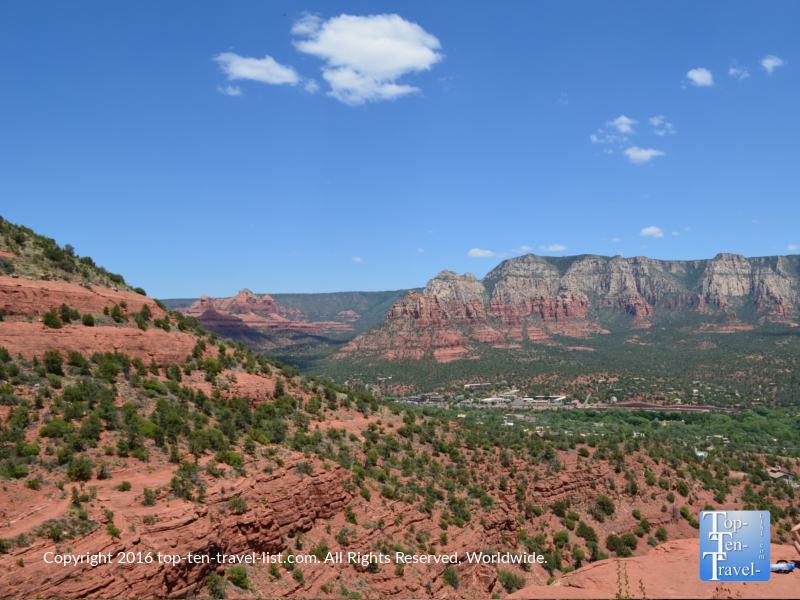 In Sedona, you can enjoy a wonderful fitness hike in the morning, followed by a great spa treatment at a luxury resort, and then dinner at a nice restaurant. 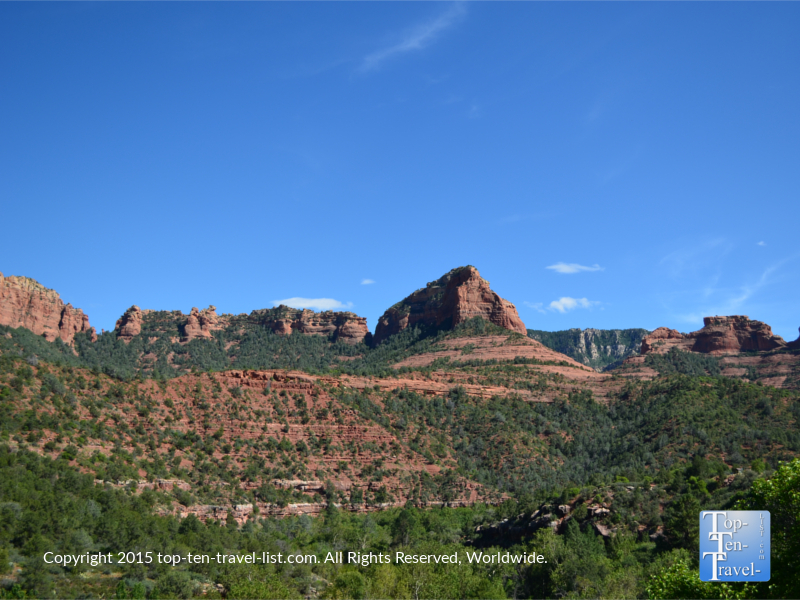 Any nature/fitness buff that would like to enjoy a bit of the great outdoors without giving up all the pampering and luxury should definitely look into Sedona as a vacation destination. Where to dine: Indian Gardens, Cucina Rustica, and The Hudson. For great views, plan for breakfast at Che-Ah-Chi in the Enchantment. For an allergy friendly meal, you cannot beat the 100% gluten-free menu at Picazzo’s. 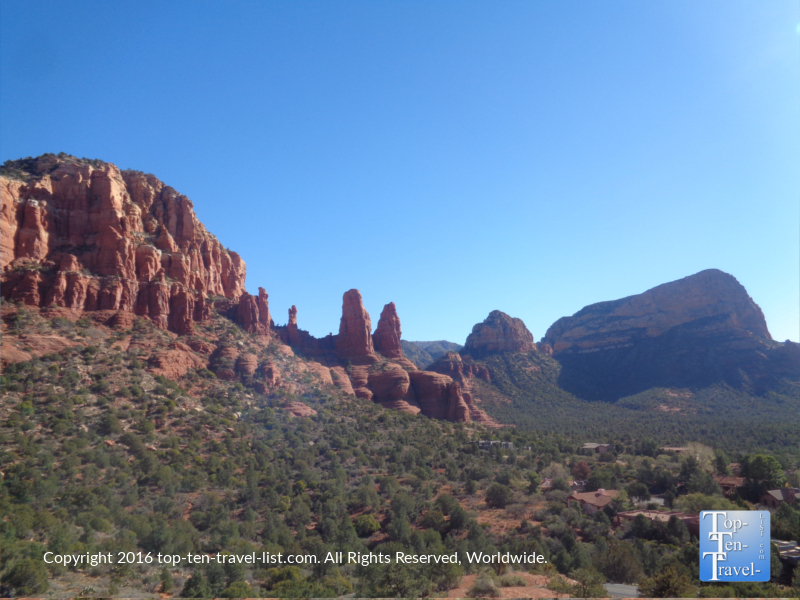 What to do: Check out my list of the top 10 things to do in Sedona & 12 Sedona Hikes with Stunning views. 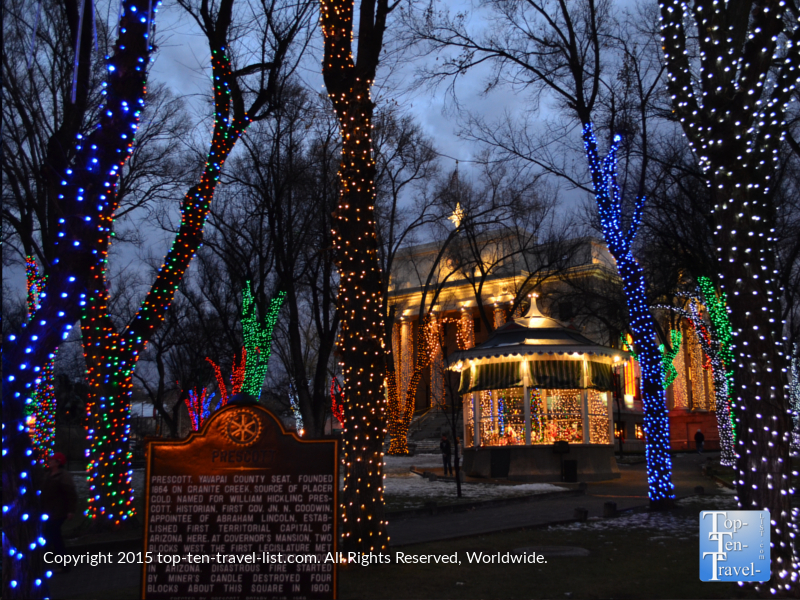 The gorgeous Christmas light display at the Yavapai County Courthouse downtown. The highlight here, and the reason Prescott draws so many tourists despite its’ small size, is due to the attractive old-fashioned downtown which we just do not find all that often nowadays. Prescott’s claim to fame is Whiskey Row, named as so for the large number of saloons located on the same block (at one point in history, 40 saloons existed!). Today the streets of this charming downtown area are lined with pretty Victorian homes & businesses, local restaurants, and cowboy western themed shops, all with the beautiful historic courthouse as the centerpiece. Whiskey Row – home to a number of saloons, plus shops and restaurants. Cuppers Coffeehouse – one of many local businesses downtown. Try out a slice of homemade quiche paired with a great espresso! Delicious authentic Marinara pasta! 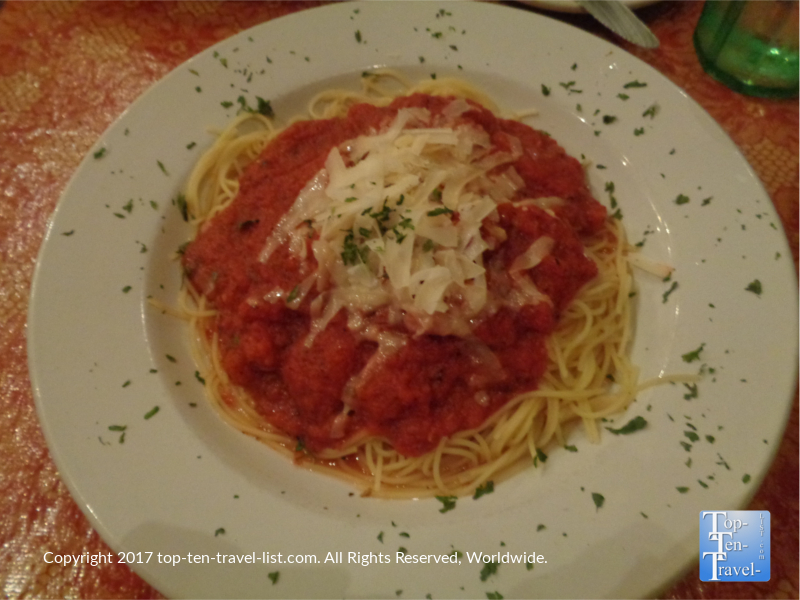 Best Italian restaurant in Prescott! 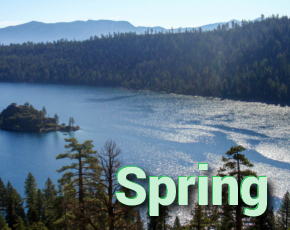 Dozens of hiking trails within the Prescott National Forest (check out Thumb Butte), 4 lakes, and a wonderful bike path known as the National Peavine Recreational Trail, make the area popular with all types of outdoor enthusiasts. And don’t worry if you are not an outdoor buff, there’s plenty for you too including a small zoo, a number of historical museums, breweries, art galleries, and even a small casino. Kayaking on beautiful Lynx Lake is a favorite summer past time! 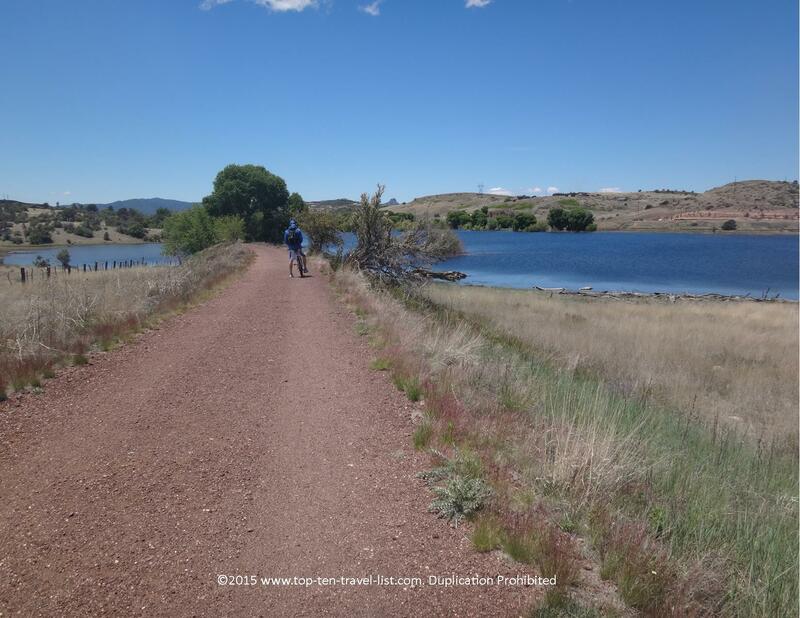 The gorgeous Peavine National Recreational trail, one of just a handful of rail trails in Arizona. 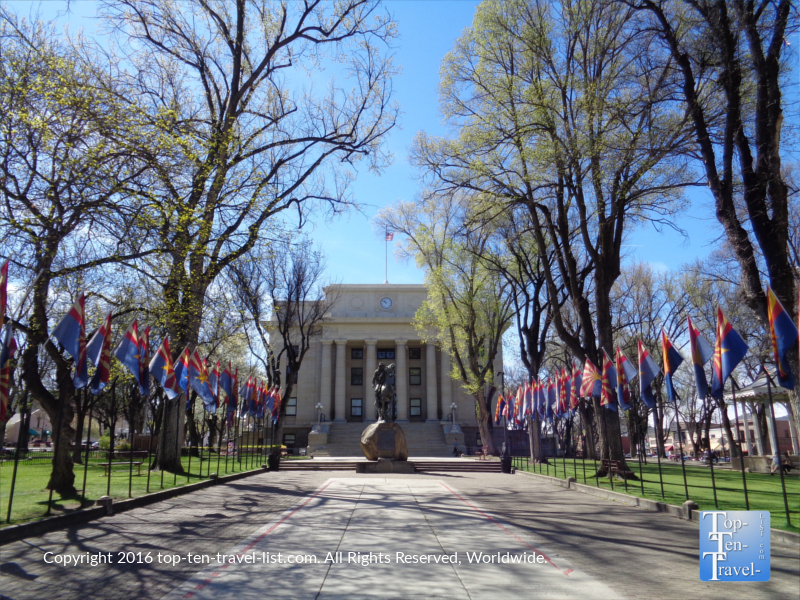 Prescott offers just enough amenities for a nice weekend trip, yet not enough to overwhelm and stress you out. And you cannot beat the rare-for-AZ 4 season weather, of which Prescott is frequently rated as having the best in the country! 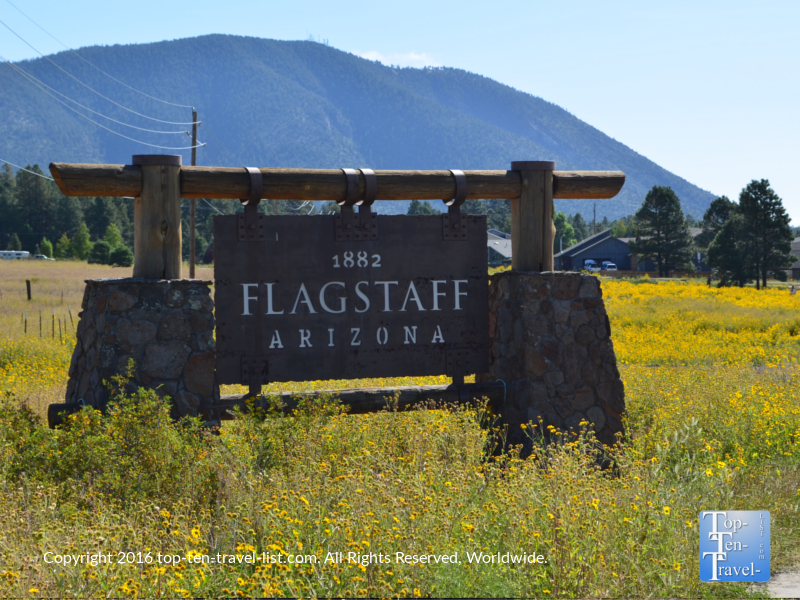 Although Flagstaff technically would not be considered a small town with a population of over 70,000 and millions of tourists visiting each year, it is quite small in comparison to the mega metro areas of Tucson and Phoenix. To anyone visiting from Southern Arizona, Flagstaff feels like a quaint little escape in the mountains. 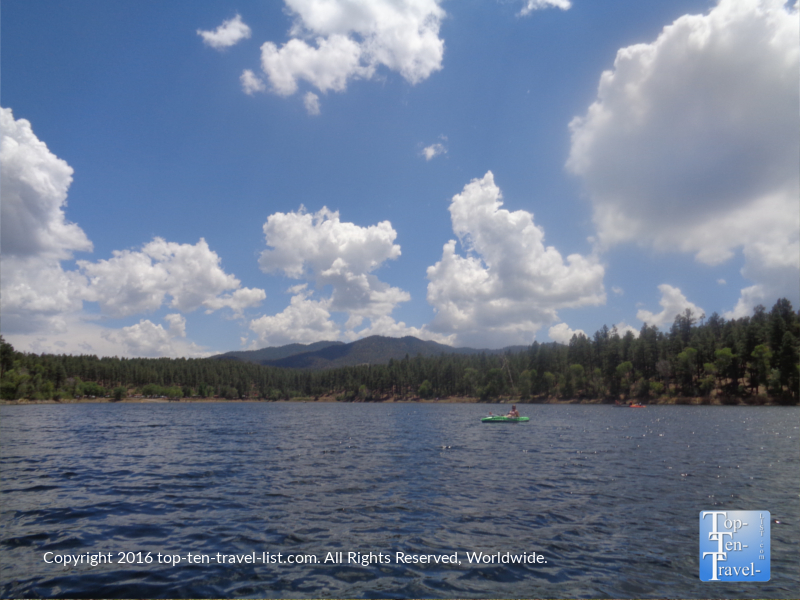 Flagstaff is just a 2 hour drive from Phoenix, and thus, a very popular cool summer escape. At an altitude of 7000 feet, the weather is considerably cooler with a distinct 4 season climate which includes mild summers rarely topping 85 degrees, a spectacular fall foliage season, and very snowy winters. Fall is by far the most gorgeous time to visit as the high altitude trails around town see some of the most amazing foliage in the country. Aspen Corner along Snowbowl Rd. is a fall hotspot for photography and hiking. Strolling through towering golden aspens on the Inner Basin trail, a steep climb of about a mile and a half which travels through some of the most amazing foliage in the West. 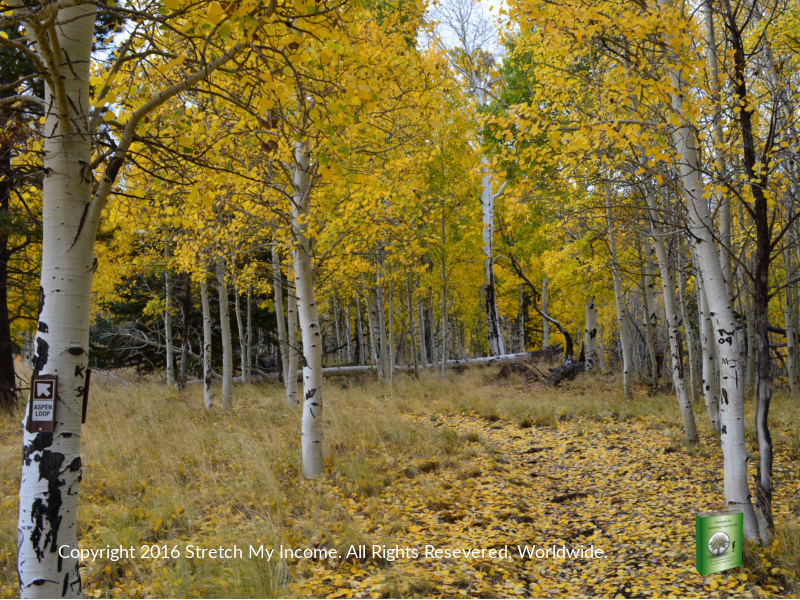 The gorgeous Aspen Nature Loop at Snowbowl, an easy 1.5 mile loop through the pines and golden aspens. Flagstaff prime benefit is its’ convenient central location for exploring many of the Southwest’s most stunning natural wonders. 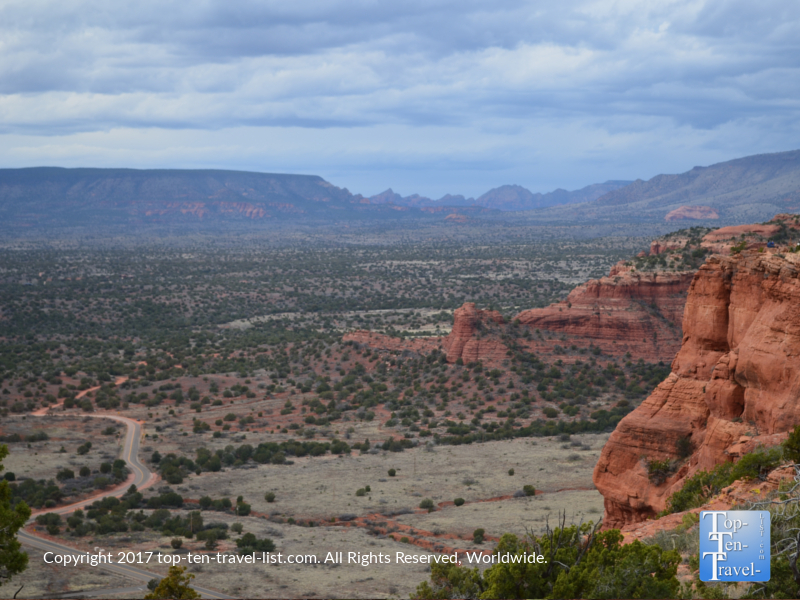 Wonderful daytrips abound in Northern Arizona, New Mexico, and Southern Utah, and all are less than 4 hours away. Of course, Flagstaff is most well-known for being just an hour or so from the Grand Canyon, and attracts millions of tourists each year. However, it also within a half day’s drive to many other wonderful places including Walnut Canyon (20 min), Zion National Park (4 hrs), Horseshoe Bend (2hr), Sedona (30 min), as well as numerous other sights of interest. Overall, it is just the perfect place to begin all your outdoor adventures in the Southwest as it is never too far away from these natural wonders, and is also home to a number of amenities on its’ own. 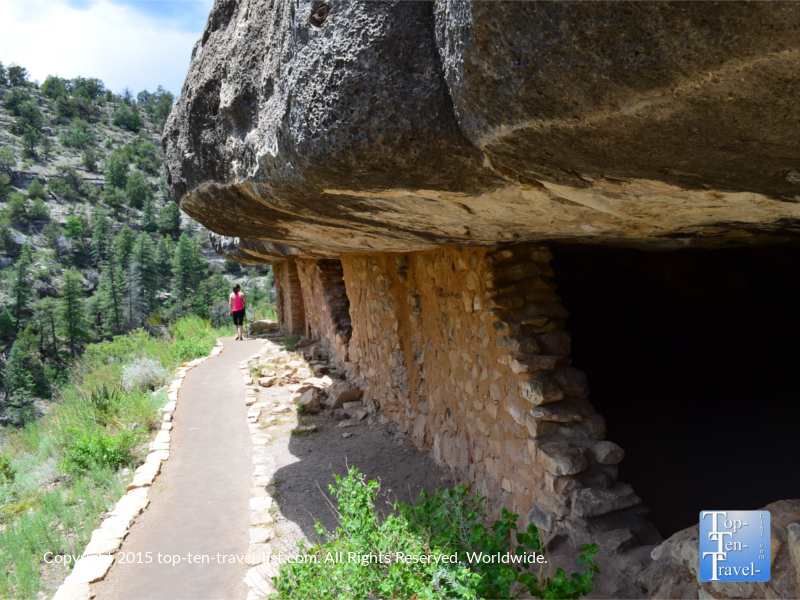 One of numerous cliff dwellings at Walnut Canyon, a gorgeous natural wonder just 7 miles outside of Flagstaff. Views from the stunning Emerald Pools trail at Zion National Park, an easy 4 hour day trip from Flagstaff. 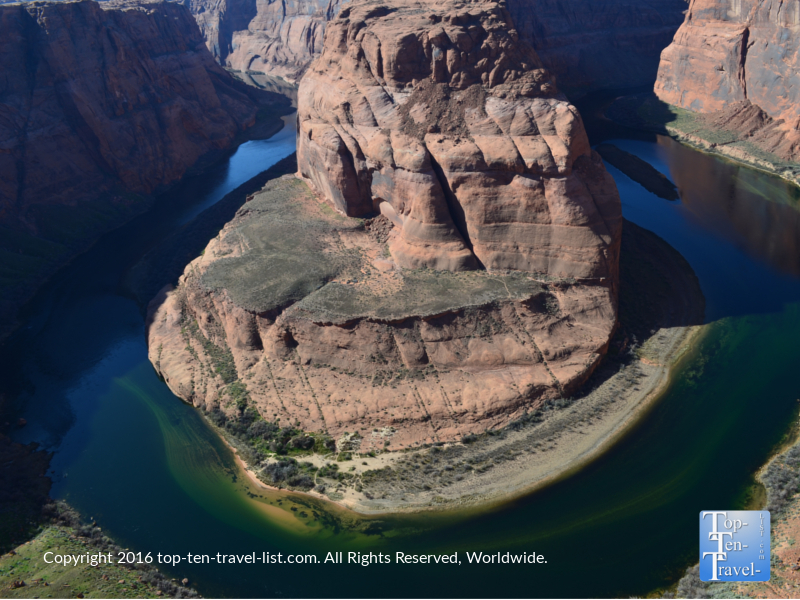 Beautiful Horseshoe Bend is located in Page, an easy 2 hour day trip from Flagstaff. 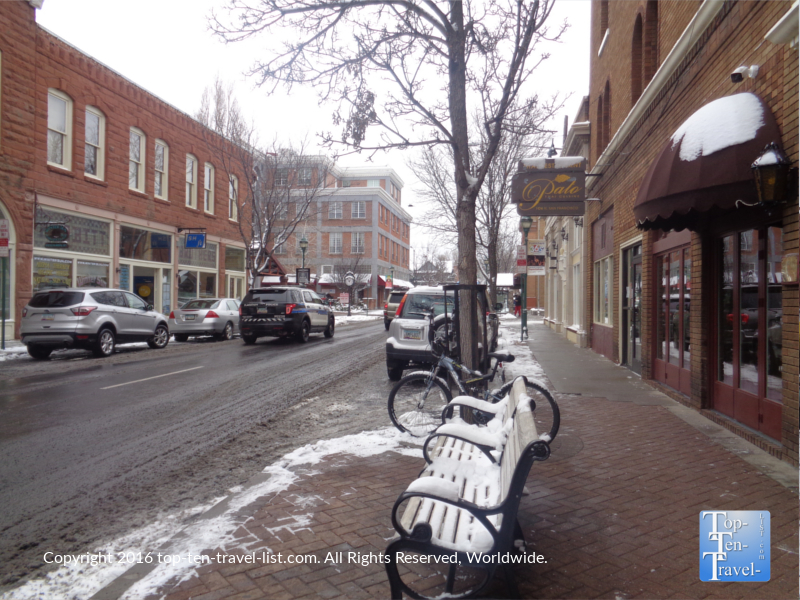 Flagstaff is home to one of the only quaint downtowns in the state. Compared to the highly suburban areas of Phoenix and Tucson, Flagstaff feels a bit more local with more independent businesses and restaurants. It’s easy to get around town and there are not a million chains crowding the streets. There are numerous small town events during the year including a hometown 4th of July Parade, pumpkin patches, farmers markets and art fairs, music fests, and much more. The coffee shops here are really great and there are many to choose amongst. Late for the Train is a wonderful local roaster with the most delicious espresso and is conveniently located right on the way to the Grand Canyon. 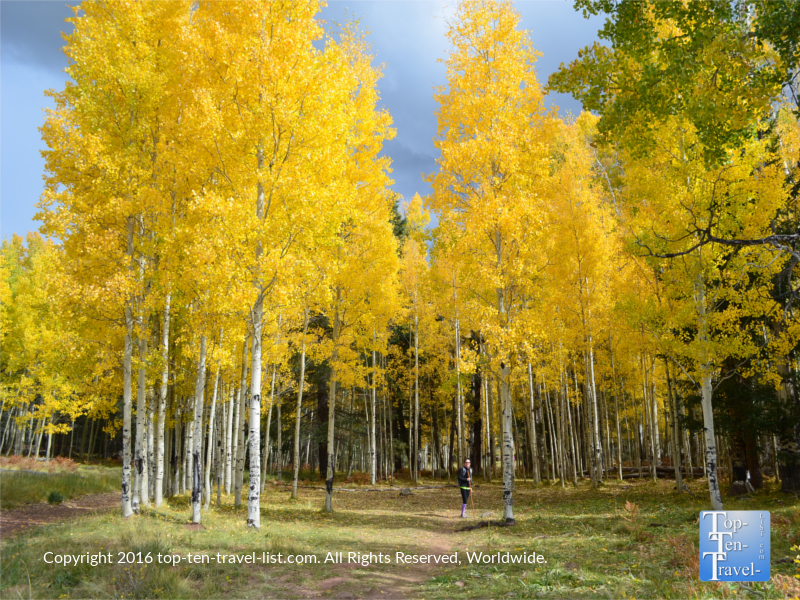 Flagstaff is a prime destination for hiking due to the beautiful mountain scenery, cool weather, and beautiful pines and aspens lining the trails. There are a number of wonderful trails around town check out 12 of my favorite Flagstaff trails to get started. Slate Mountain, the most underrated & underused trail in Flagstaff. A gorgeous moderate climb to stunning views of the Peaks! A must-do for any hikers visiting the area! 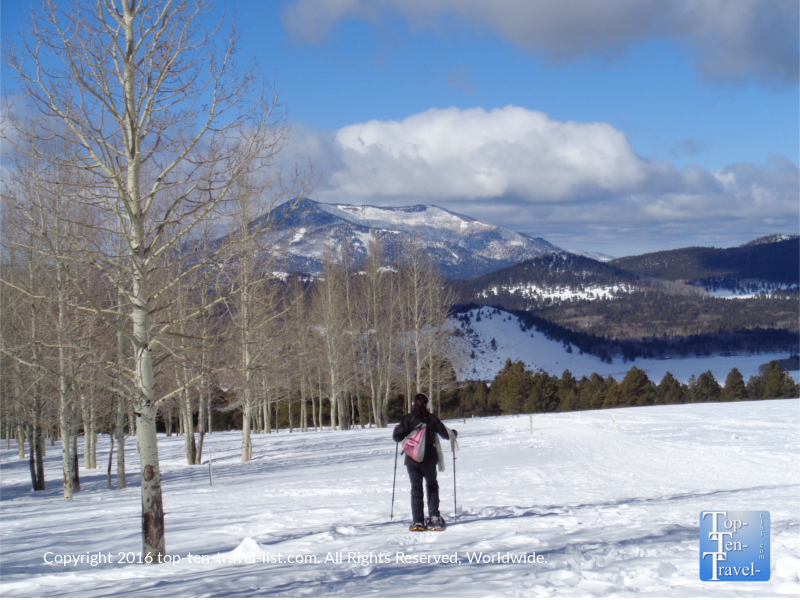 Flagstaff is home to Arizona Snowbowl, one of the state’s only ski resorts and also a prime place to hike. There are 3 trails at Snowbowl, which are great for year-round use, from cool hiking in the summer, to fall leaf peeping in the autumn, to snowshoeing in the winter. 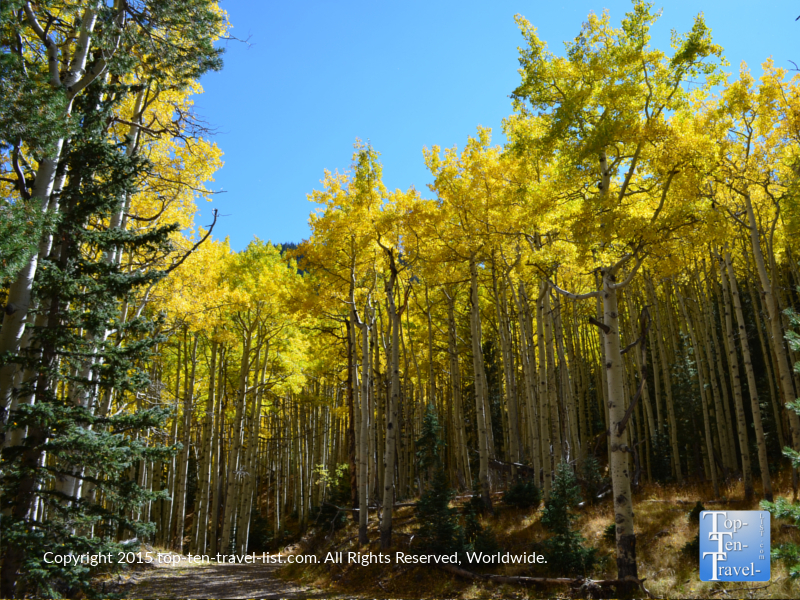 The Aspen Nature Loop is the perfect year-round trail. At just over a mile and a half, it’s a good option for hikers of all levels. Plus, it’s incredibly picturesque with scenic mountain vistas, towering pines and aspens, and the most golden hues come fall! Towering pines along the Kachina Trail at Arizona Snowbowl. At 8-9000 feet and 20 degrees cooler than town, it’s the perfect cool summer escape! Snowshoeing the Aspen Nature Loop at Snowbowl during the snowy winter season. Snowbowl receives over 200 inches per year so there is always enough on the ground even when the snow melts in town. 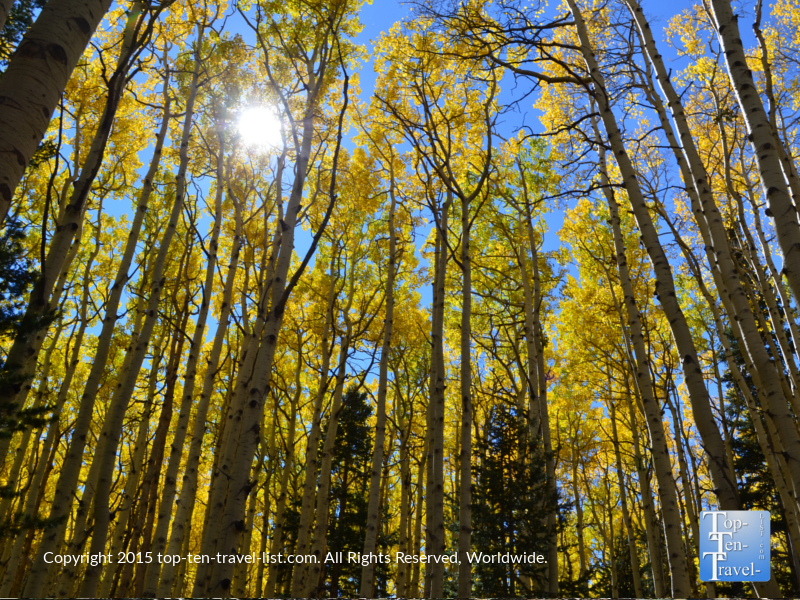 Whether you are looking to escape the brutal heat of the desert, seeking a beautiful autumn getaway, looking to rent a cabin in the snowy pines, or simply looking for a great base to explore the natural wonders of the Southwest, Flagstaff is a destination worth checking out. Where to stay: Little America, Doubletree, Drury Inn & Suites. Unfortunately, there are not many resorts or mountain style lodging area. However, individual house rentals are available. 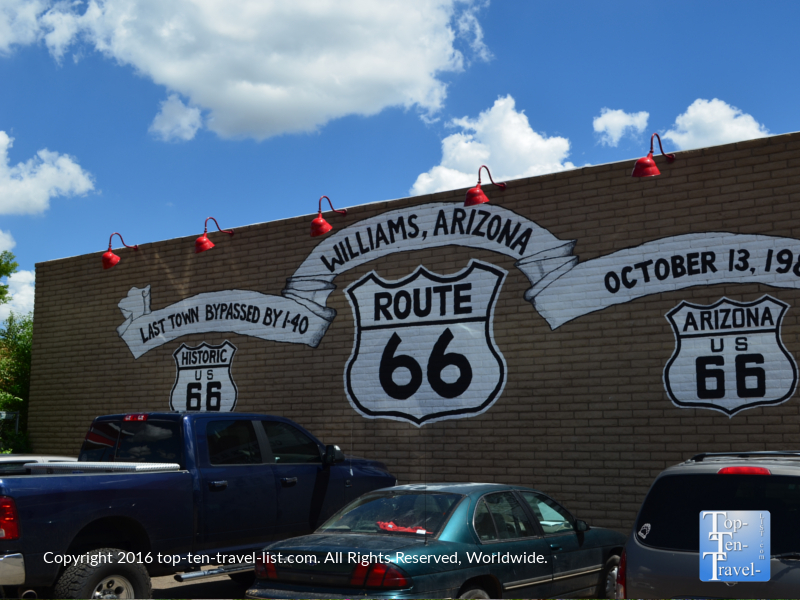 Williams, whose claim to fame is being the last Rt 66 town to be bypassed by I-40, is a popular tourist destination in the summer months due to the close proximity (just an hour) to the Grand Canyon. 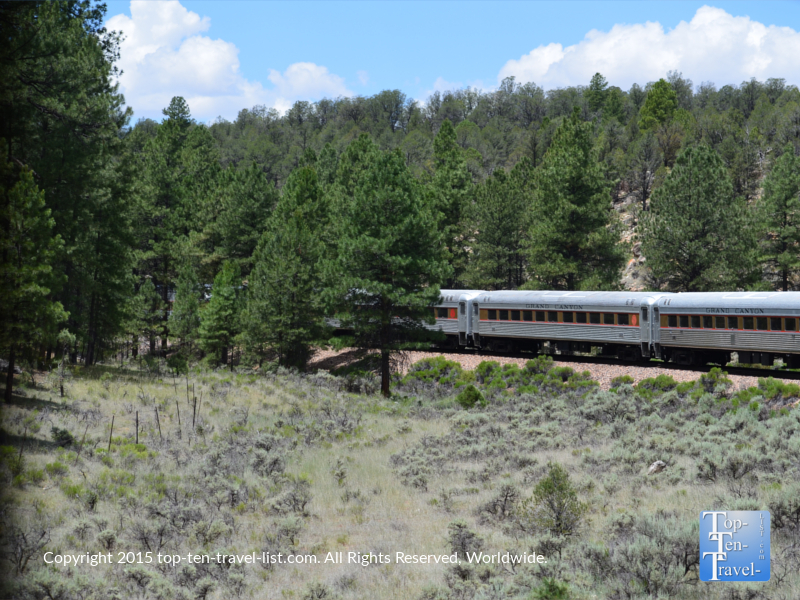 A popular train ride known as the Grand Canyon Railway offers a convenient, albeit a bit overpriced, alternative mode of transportation to this natural wonder. 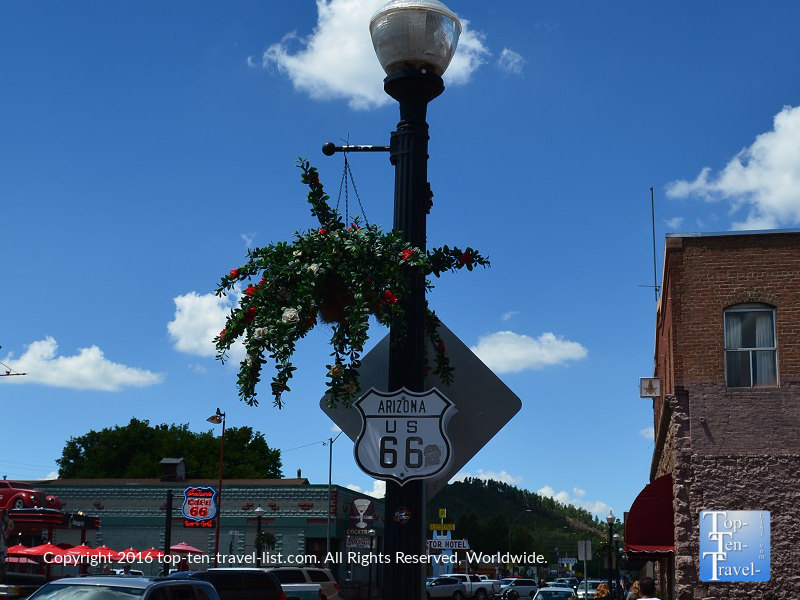 In fact, the town’s slogan is “Gateway to the Grand Canyon.” This little community tends to get super busy at 2 times of the year: during Grand Canyon season and during the winter when the seasonal Polar Express train ride (based on the children’s holiday classic) opens up. 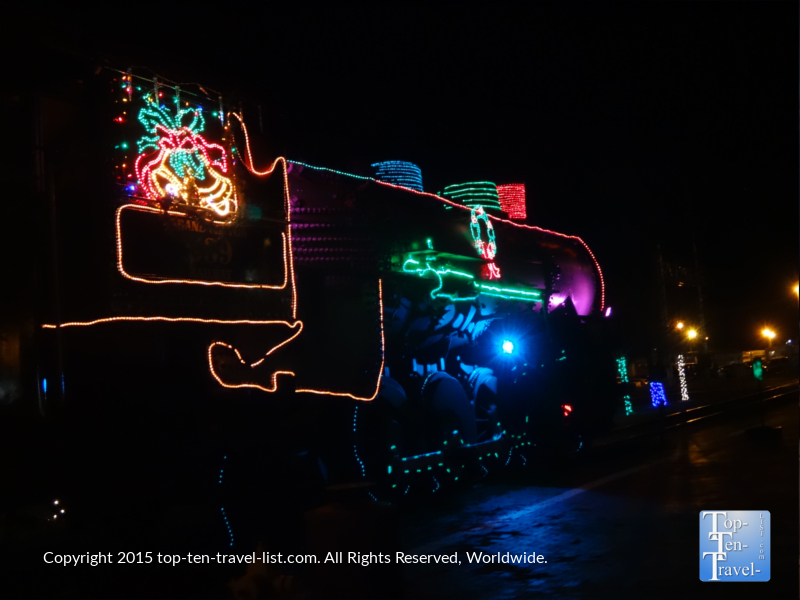 The Polar Express train ride all decked out for the holidays. The rest of the year it is a pretty quiet, laid-back place to base your Northern Arizona vacation, and is conveniently located within a short drive to many wonderful natural attractions. 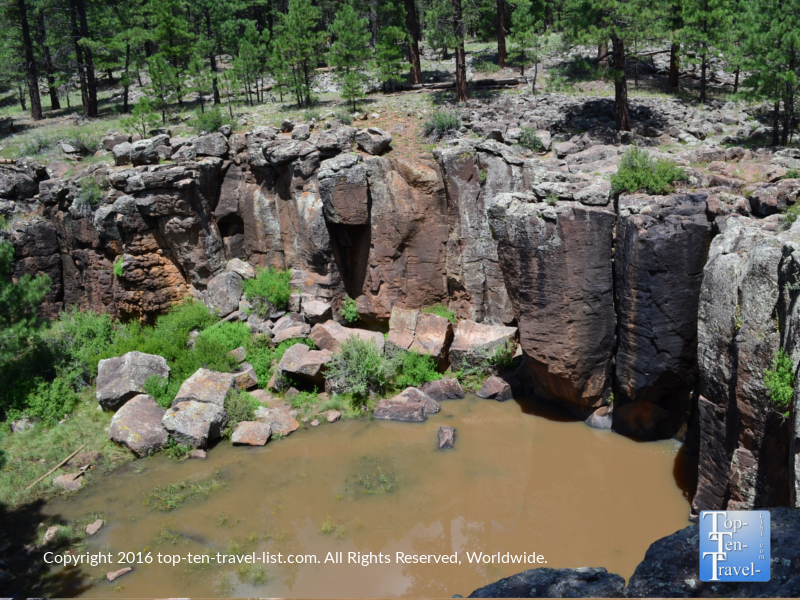 Being that it is nestled in the high altitude ponderosa pine forest of Northern Arizona, there are plenty of great hikes within the Kalibab National Forest to enjoy (check out Kendrick Mountain and Keyhole Sink). 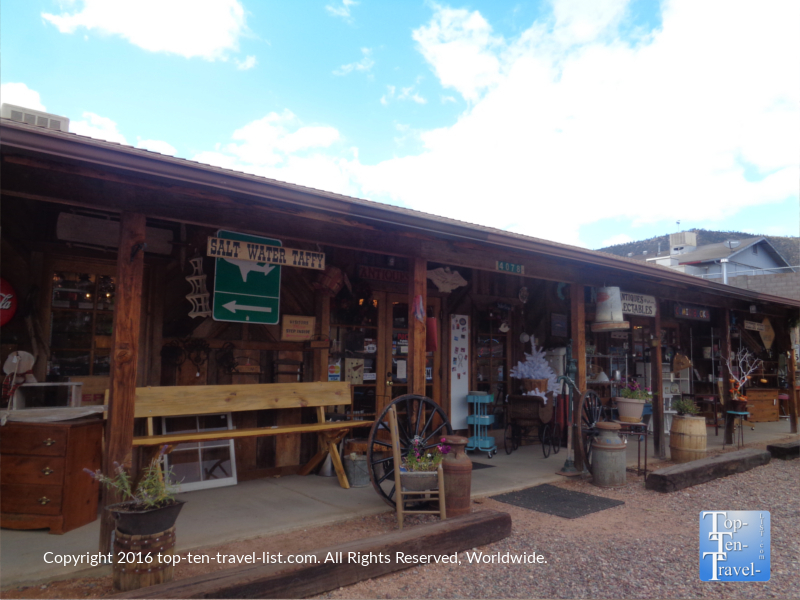 Other must-do’s include Bearizona (a top rated drive-thru wildlife park), exploring Rt 66 memorabilia shops and themed diners downtown, and planning a day trip to Flagstaff (home to Humphrey’s Peak: the tallest peak in Arizona at 12637 ft). 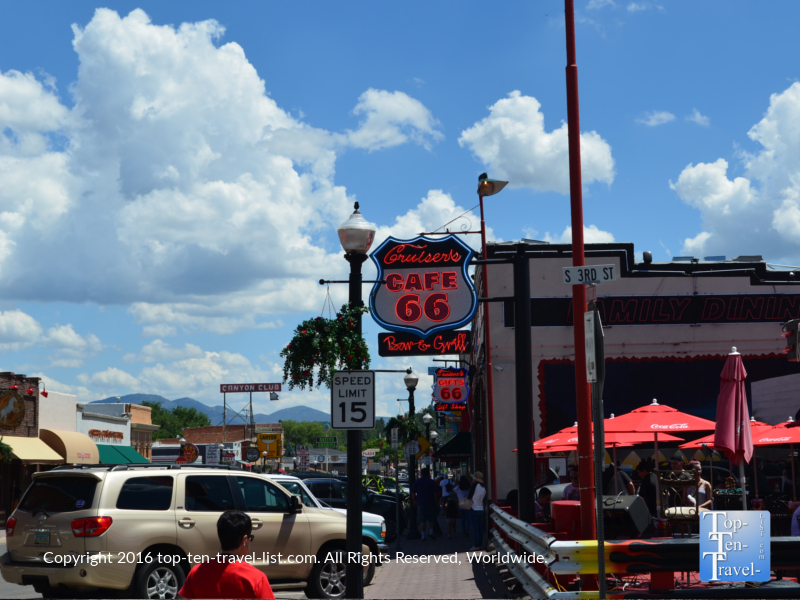 An abundance of Rt 66 themed diners and memorabilia gift shops should keep you busy for a few hours! 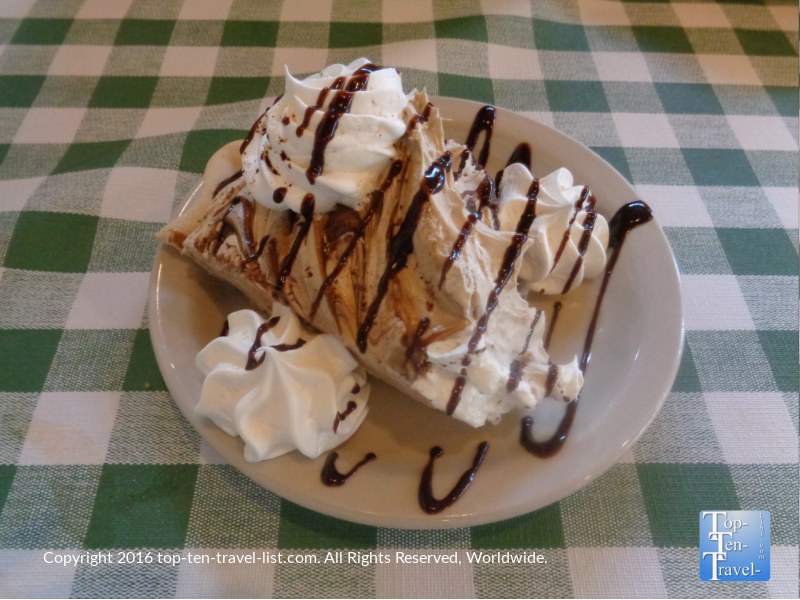 Dozens of unique flavors of homemade pie await you at Pine Country restaurant. No visit to Williams is complete with a visit to Bearizona! A scenic drive-thru the park, as well as a walk thru section, will give you an upclose views of animals in a setting mimicking their natural environment. Gorgeous views from the Keyhole Sink trail – a must-do for nature lovers visiting Williams. 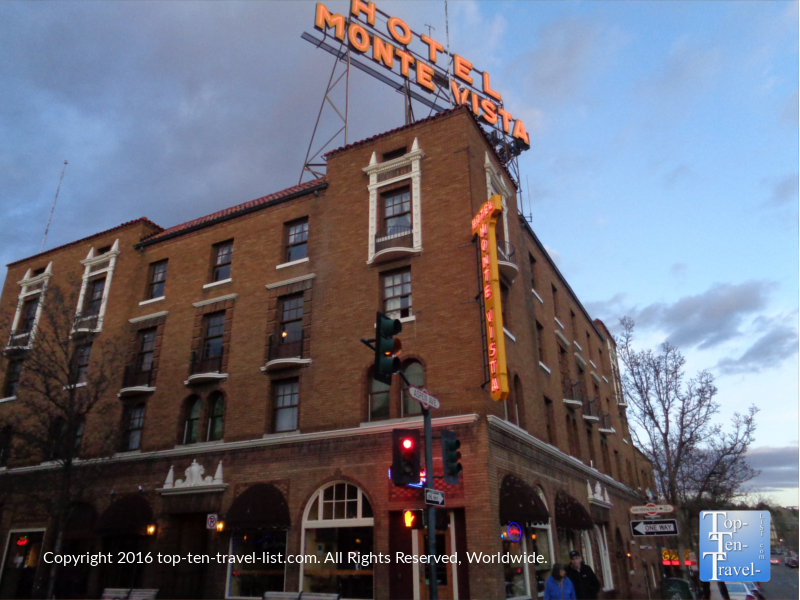 Downtown Flagstaff – home to lots of independent restaurants, coffee shops, art galleries, and the Monte Vista, one of the most haunted hotels in America! 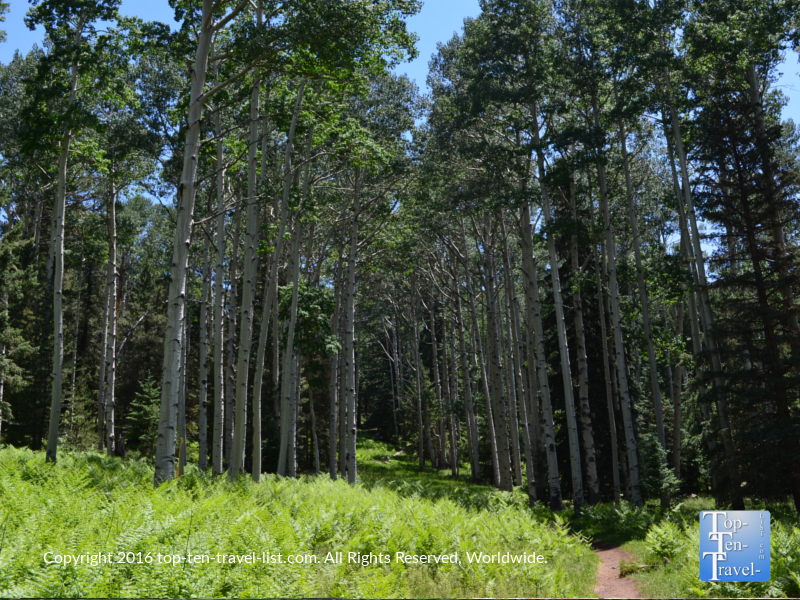 A day trip to Flagstaff to explore the various trails at Snowbowl is a must! 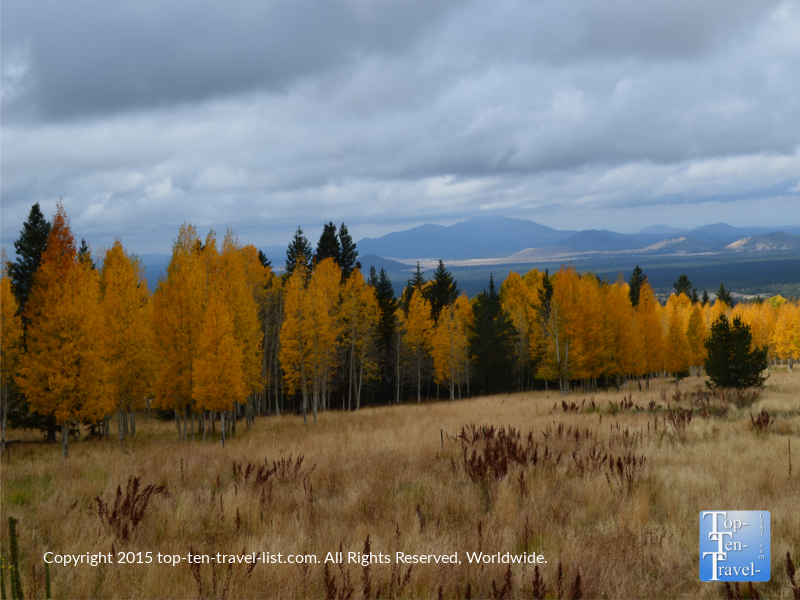 Flagstaff is the premier leaf peeping destination in Arizona. The foliage here rivals some of the best in New England. Check out the Inner Basin trail, Bear Jaw, and any of the Snowbowl trails! Arizona Snowbowl is the state’s premier site for any type of winter sports -downhill skiing, snowshoeing, and cross country skiing! Gorgeous views too! 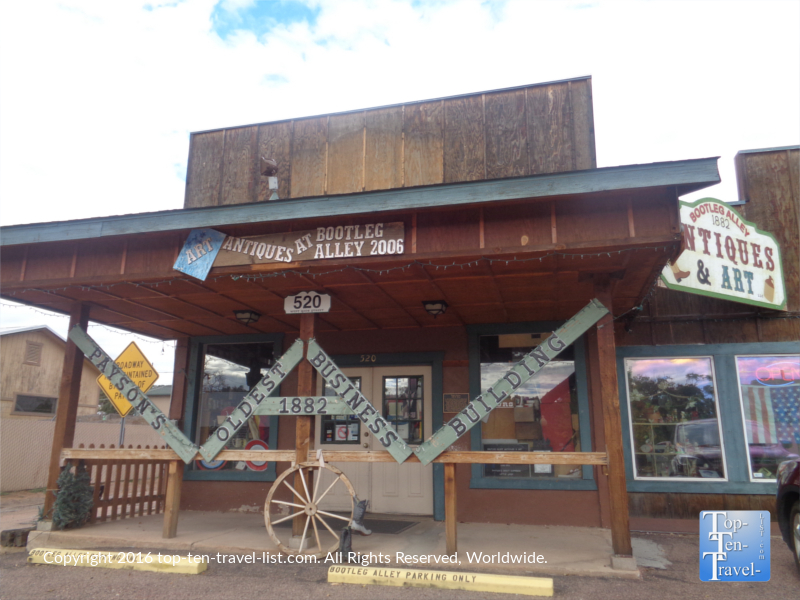 Overall, Williams is a great base for exploring the many national parks and monuments scattered all over Northern Arizona, and has the advantage of being much less hectic that the more popular alternative, Flagstaff. Williams is also closer to the Grand Canyon than Flagstaff. 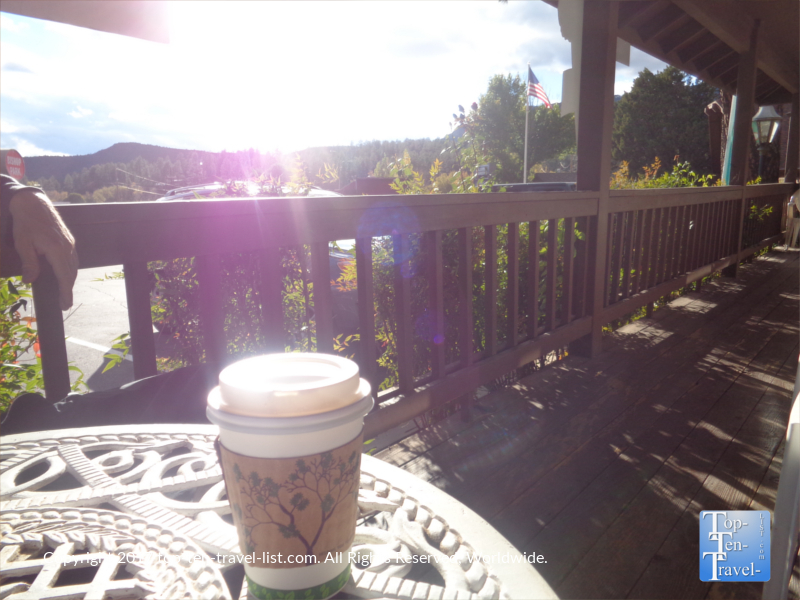 I recommend enjoying a quieter stay in Williams and simply planning on a day trip to Flagstaff to explore all the wonderful trails. 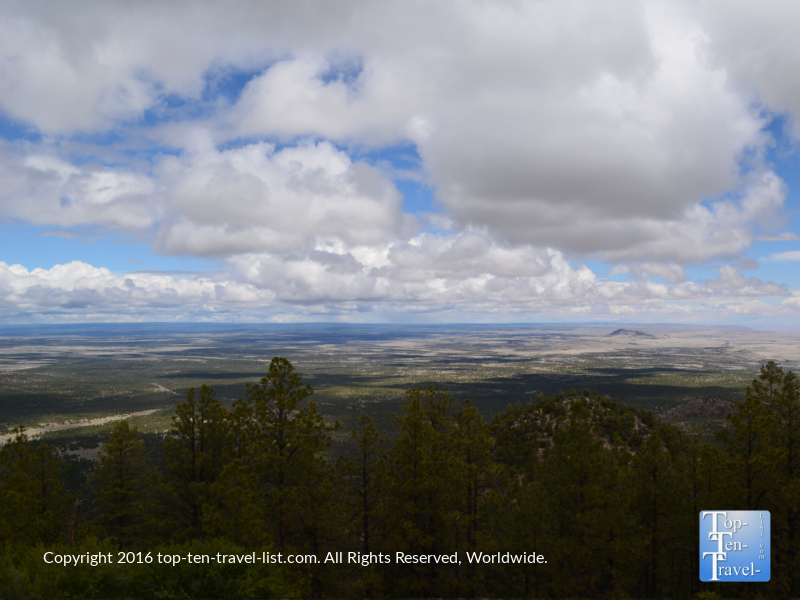 Here’s 12 must-do hikes in Flagstaff with spectacular views! Payson is a tiny little community of just 15000 or so in the central portion of the state, about an hour and a half north of Phoenix. Payson is located in the heart of scenic Rim Country, surrounded by the beautiful Tonto National Forest, and thus, offers plenty in the way of outdoor recreation. 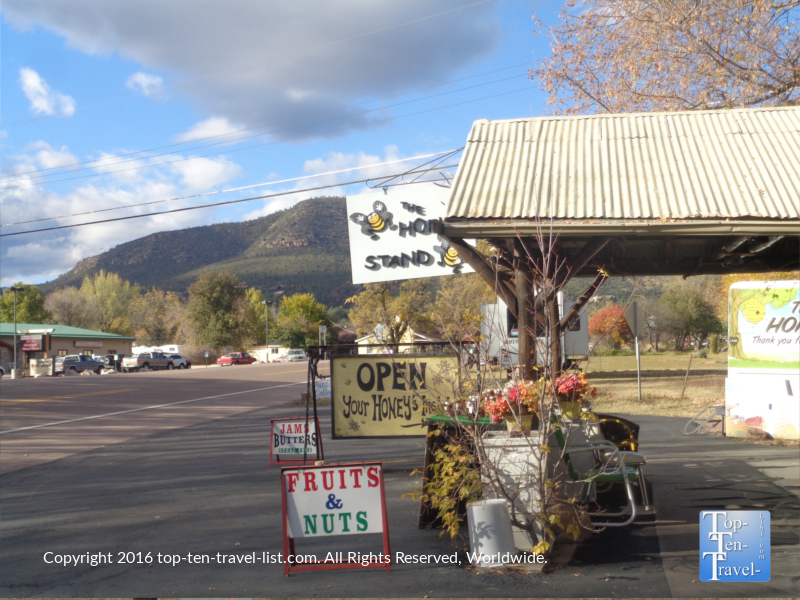 Payson’s motto is “Arizona’s coolest mountain town.” Due to the high elevation (5000 feet), Payson sees an attractive diverse geography and pleasant 4 season climate, with temps rarely reaching the 100’s like Phoenix, and occasional snow, although it melts pretty quickly. This attractive climate makes it a popular vacation destination for Southern Arizona residents fleeing the summer heat, as well as those seeking some traditional winter snow & a more rustic ambiance. The beautiful scenery surrounding Payson. 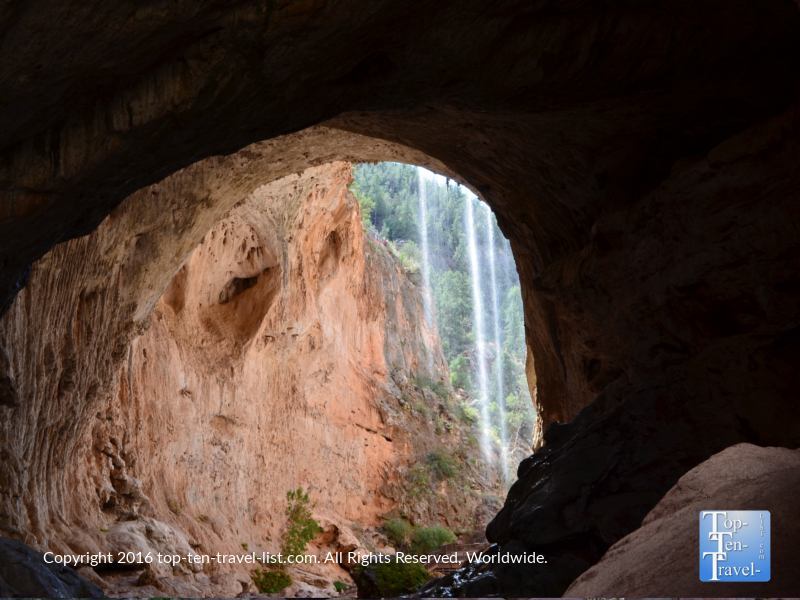 The highlight of visiting Payson is the close proximity to Tonto Natural Bridge State Park, a gorgeous underrated gem which is home to the world’s largest natural travertine bridge and a natural waterfall. A pick amongst several trails of varying difficulty all lead you to this spectacular natural wonder. 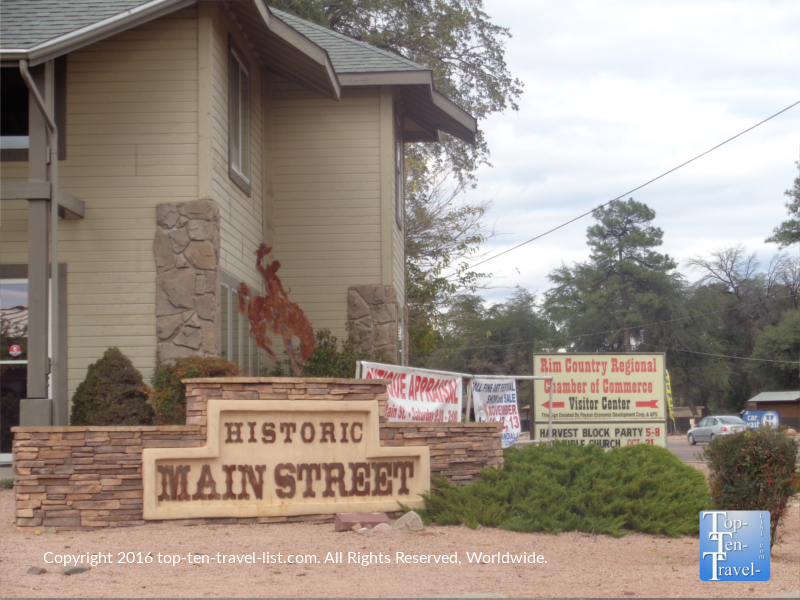 Other things to do in Payson include visiting the small Mazatzal Casino, browsing antique shops, hiking within the Tonto National Forest, stargazing, leaf peeping in the fall, and checking out local restaurants, shops, and galleries. 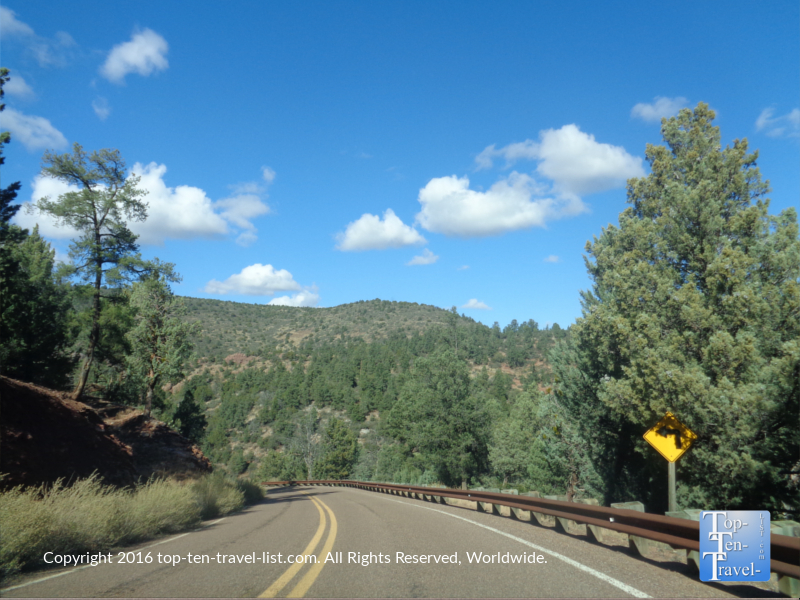 A drive along the scenic Mongollon Rim featuring dramatic panoramas of ponderosa pine trees is a much – check out the section between Strawberry and Payson. Be sure to check out the annual rodeo, which is the oldest continuous rodeo in the world. If you happen to be visiting around the holidays, Payson puts on a number of festive events including a great Electric Light Parade. One of numerous antique shops in downtown Payson. 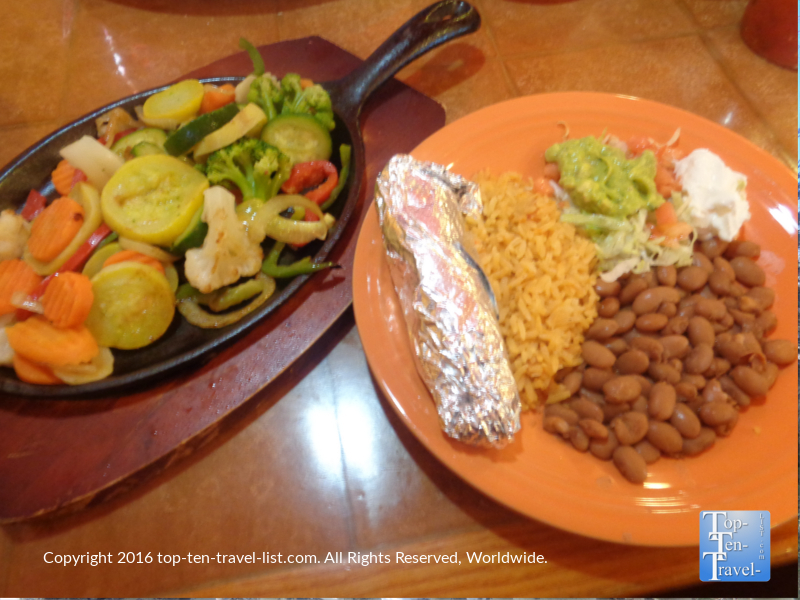 La Sierra – one of the best dining choices in this small town. Delicious fajitas! Payson is a nice destination to rent a cabin and get away from it all for a while. 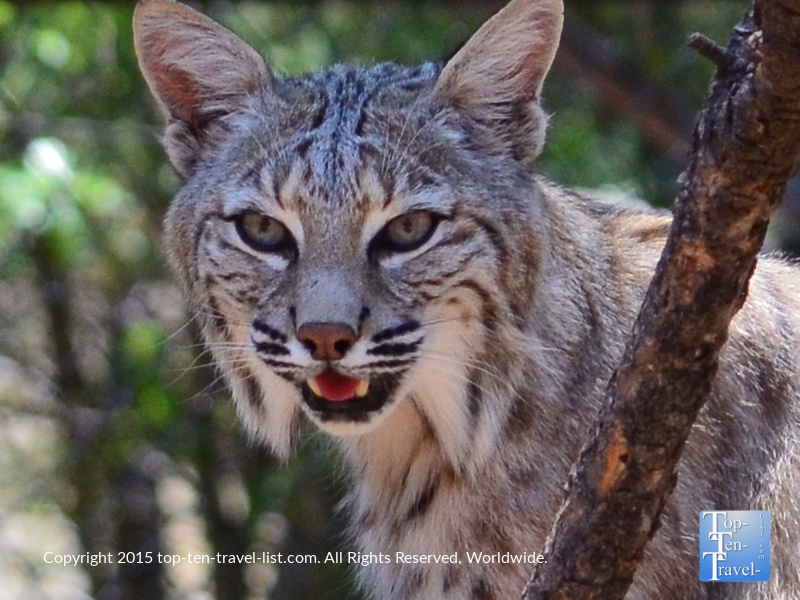 It’s not overly crowded or touristy like the more popular Northern Arizona destinations. It’s still within an easy drive to many natural wonders (Grand Canyon, Sedona, Flagstaff, Petrified National Forest, Walnut Canyon), only with the advantage of having a quieter base to come back to. Jerome is often referred to as the “largest ghost town in America.” Although the community was once a thriving copper mining town, the Great Depression lead to mines closing, and thus, a population which once topped 15,000 dwindled down to almost nothing, hence the nickname. 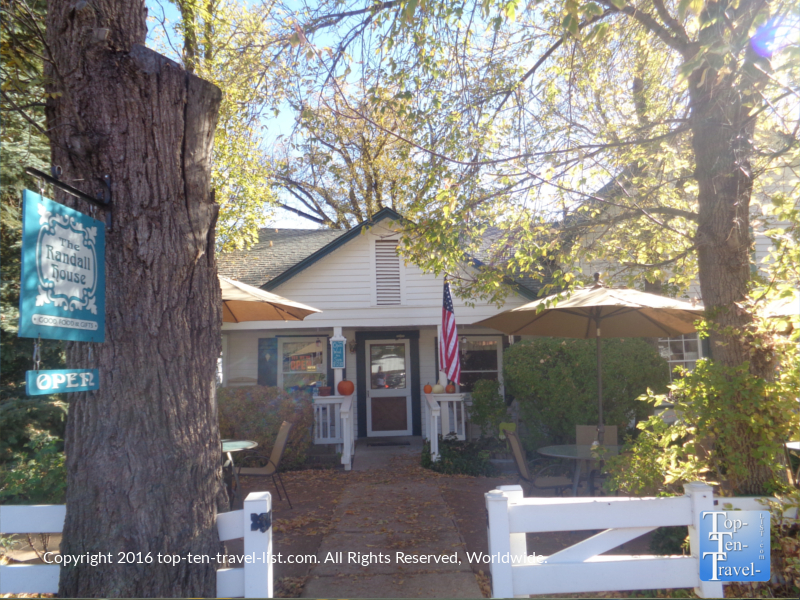 Today the population sits at only 400, although it is a thriving tourist town due to its’ gorgeous location atop Cleopatra Hill overlooking the beautiful Verde Valley, thriving arts community (over 20 galleries! ), close proximity to natural attractions, well regarded vineyards and wine tasting rooms, and long paranormal history/festive Halloween celebrations. The New York Sun once referred to Jerome as “the wickedest town in the West,” due to the area’s reputation as being a gambling and prostitution hotspot- today you will find that the area is much different. 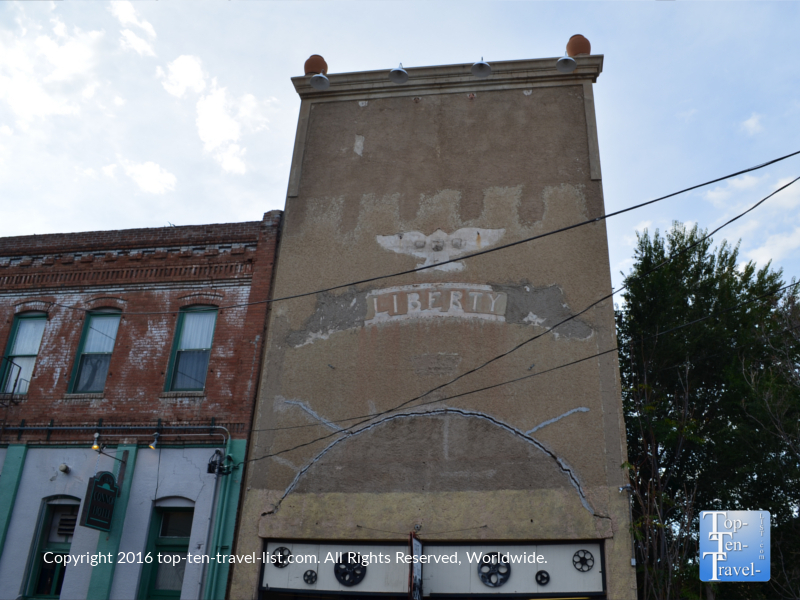 The Liberty Theater, which opened up in 1918, screened silent movies and vaudeville acts. Today, it is a museum, gift shop, and working theater. It’s a neat experience to watch a film back as you would in the 20’s. The House of Joy, once a brothel, then a restaurant, and now operates as a boutique shop. Hull Avenue was once a hotbed for prostitution. The most interesting aspect of the town is the long history of paranormal occurrences. 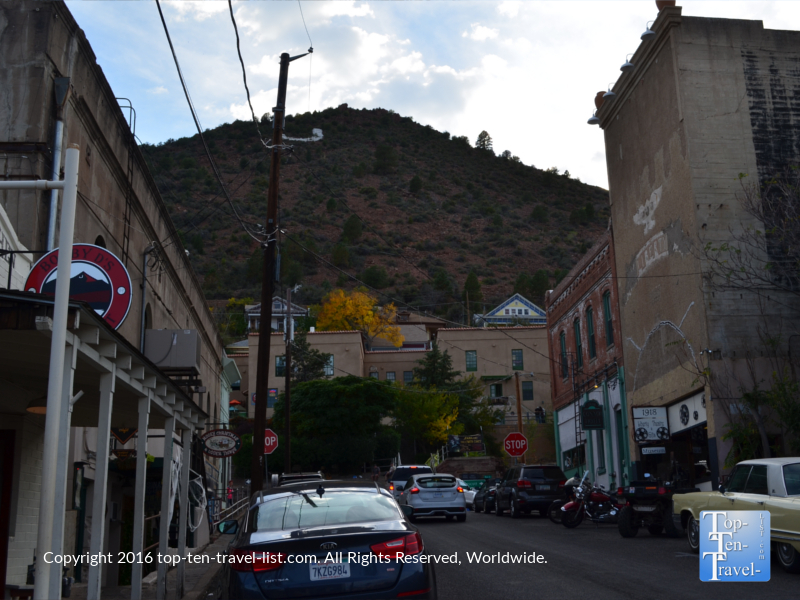 In fact, Jerome has been said to be one of the most haunted towns in the country. Legends of ghost hauntings go back decades and still continue today! At one point, the town even published a Jerome Ghost Post. The community center is nicknamed Spook Hall due to the repeated number of strange occurrences over the years. A ghostly cat has been sighted by numerous guests at the Mile High Inn. 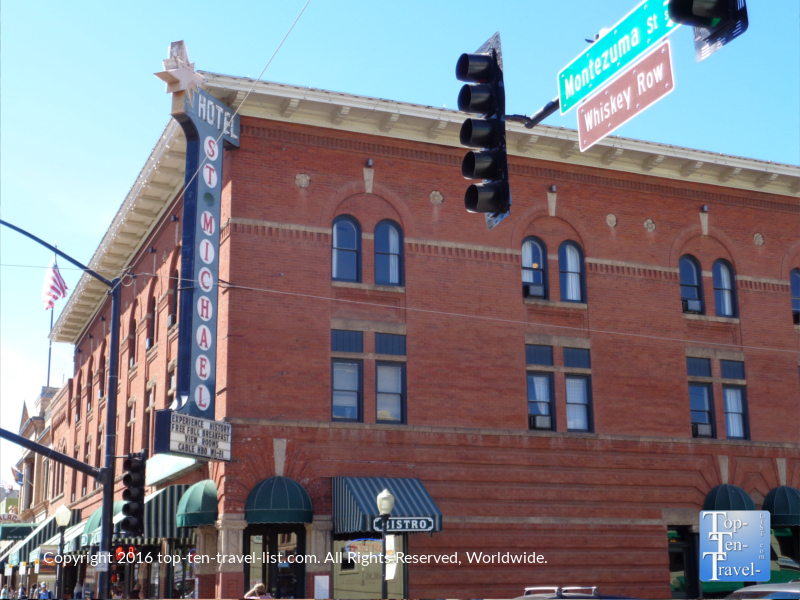 Mile High Inn is one of Jerome’s most haunted buildings. Do not be surprised if you see a ghostly cat! The ghost of miner “Headless Charlie” who died in a gruesome accident is said to still roam the area. 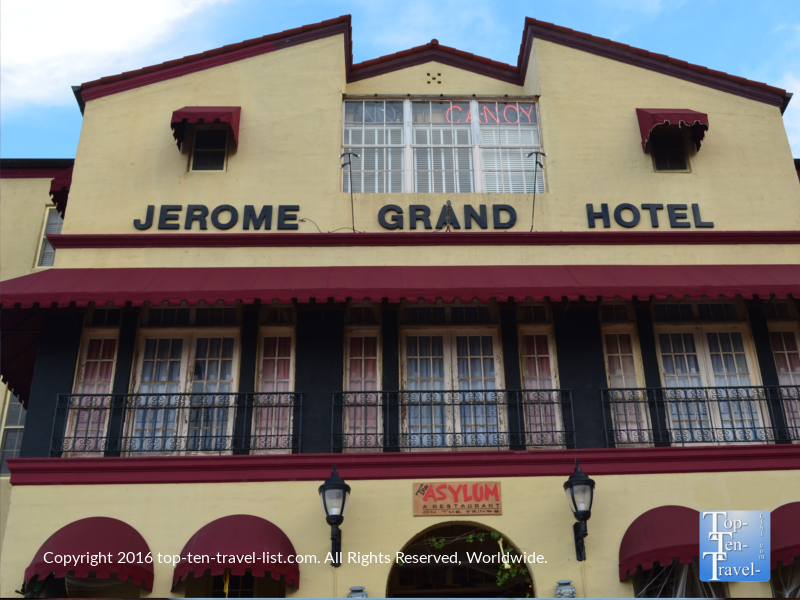 And the Jerome Grand Hotel, once an asylum, is so haunted that guests often end up sleeping in the lobby! You can take a ghost tour anytime of the year, although it is more fun around Halloween! You’ll learn more about all the ghostly sightings and even get to test out ghost hunting equipment. 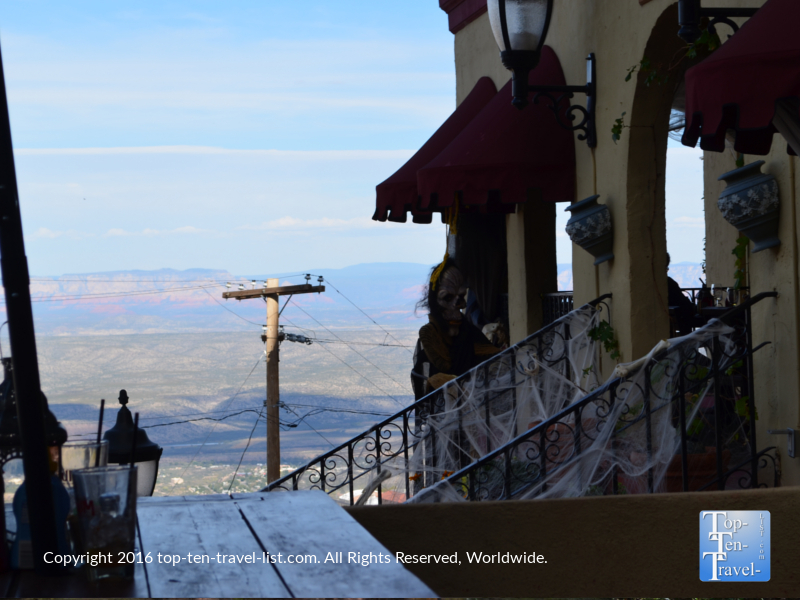 Jerome is a popular Arizona Halloween destination and goes all out with a number of events and an abundance of crazy decorations, especially at the Jerome Grand Hotel/Asylum Restaurant. 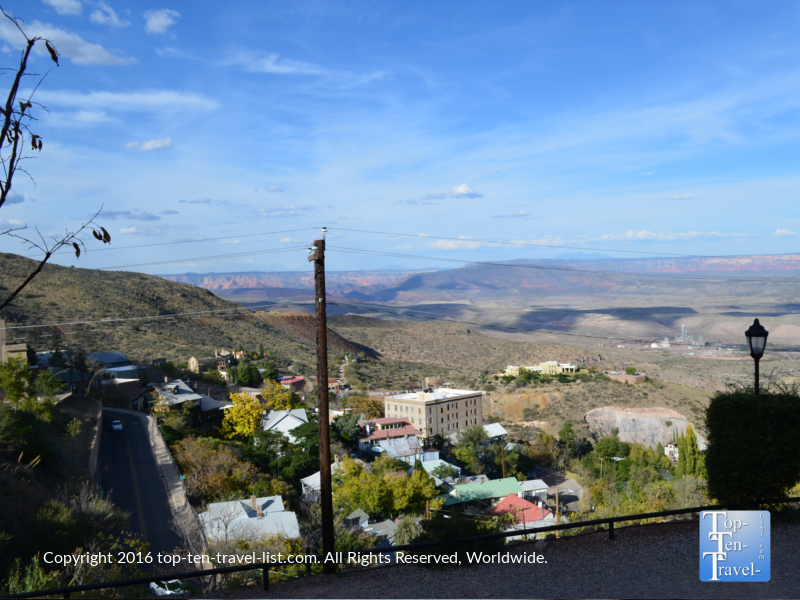 Spooky decor, great views, and mild weather make an October visit to Jerome a must! 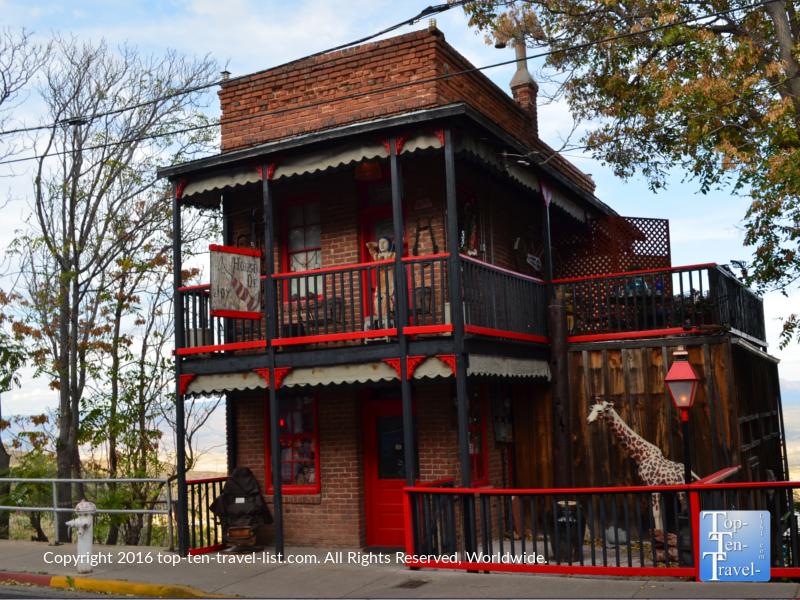 Jerome is an Arizona town rich in history, with beautiful old architecture and an artsy vibe. While here, you can stroll around and enjoy the gorgeous scenery of the Verde Valley, learn about the town’s history at Jerome State Park, dine at the beautiful Asylum Restaurant, enjoy local Arizona wine at one of the many tasting room, check out local art galleries(a popular Art Walk is held the 1st Sat of each month), and browse around independent shops. 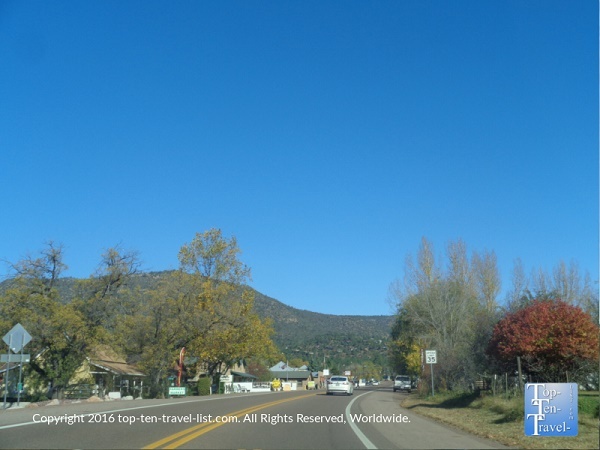 Additionally, Jerome is located just a short drive from Prescott, Sedona, and Flagstaff, so you can check out all the great attractions in these areas as well. What to do: Ghost tour at the Jerome Grand Hotel, Visit Jerome State Historic Park, Wine tasting at Cellar 433. Be sure to stop for some local honey at The Honey Stand in pine! There are so many different varieties of delicious homemade honey available! 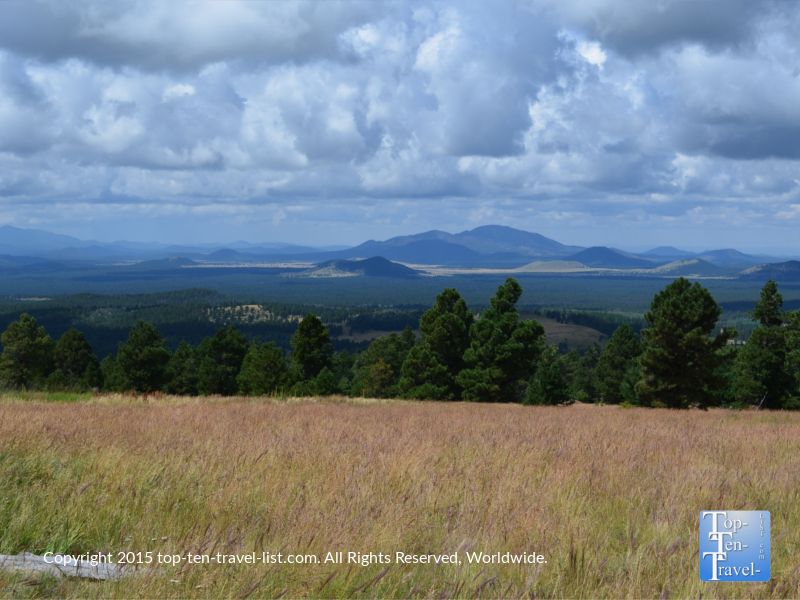 Pine and Strawberry are 2 tiny communities in North Central Arizona which are becoming more and more popular with 2nd home owners seeking a quiet escape in the countryside. As the elevation varies between 5000-6000 feet, the summer temps stay much cooler than Phoenix, making it a popular weekend summer weekend destination. Both towns are part of the gorgeous Mongollon Rim Country area, which is located within a large ponderoaa pine forest. 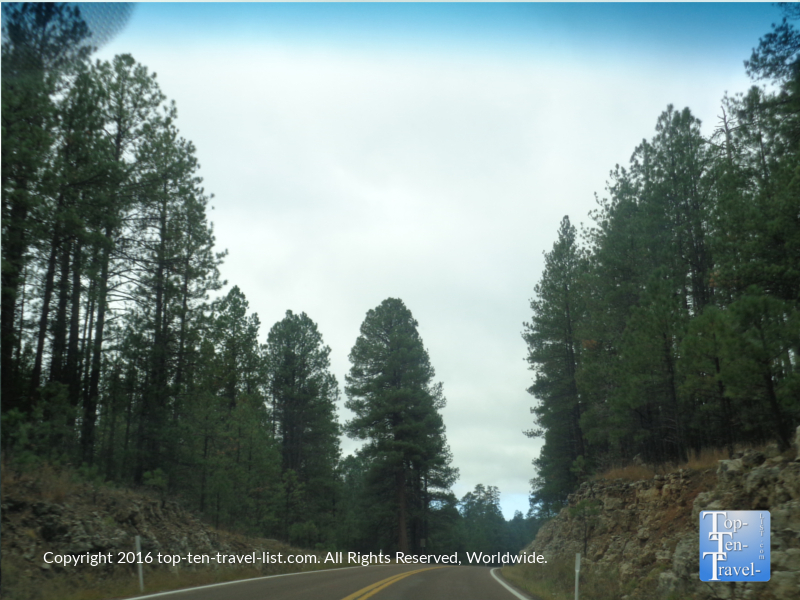 Gorgeous ponderosa pine forest surrounds Pine and Strawberry. Beautiful countryside scenery in rural Pine. 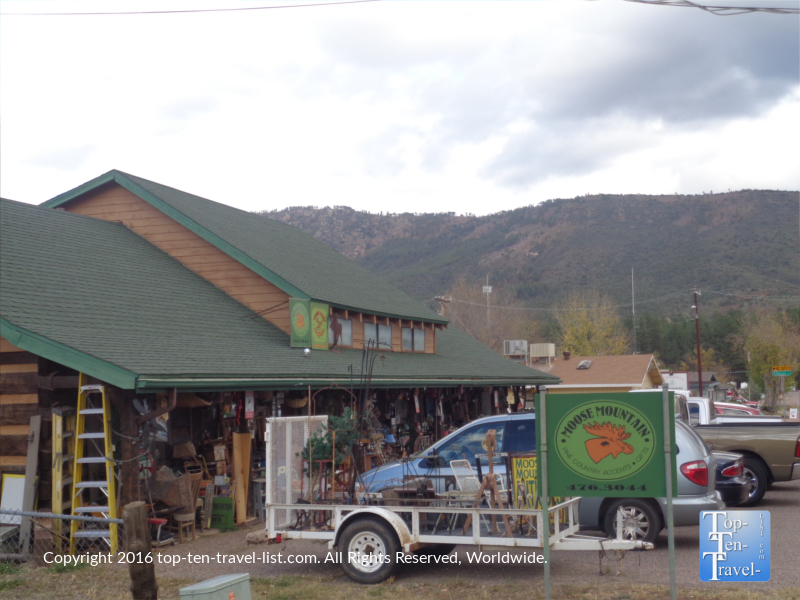 Antique shopping is one of the most popular past times in Pine. You will not find a lot of big box stores or chains here, thus the basis of its’ appeal for those seeking a laid-back day trip/vacation. There are a few cute local restaurants like the Randall House which features a nice shady outdoor patio. A stop at Pine Creek Fudge and Ice Cream is a must and they are also one of the few places serving espresso drinks (sorry, no Starbucks here!). Stop for a great espresso drink and slice of homemade fudge at Pine Creek Fudge Ice Cream & Espresso. They have a great patio where you can enjoy your treats in the beautiful country air! A beautiful country setting at the Randall House in Pine. Moose Mountain Antiques and gifts – a must-see! 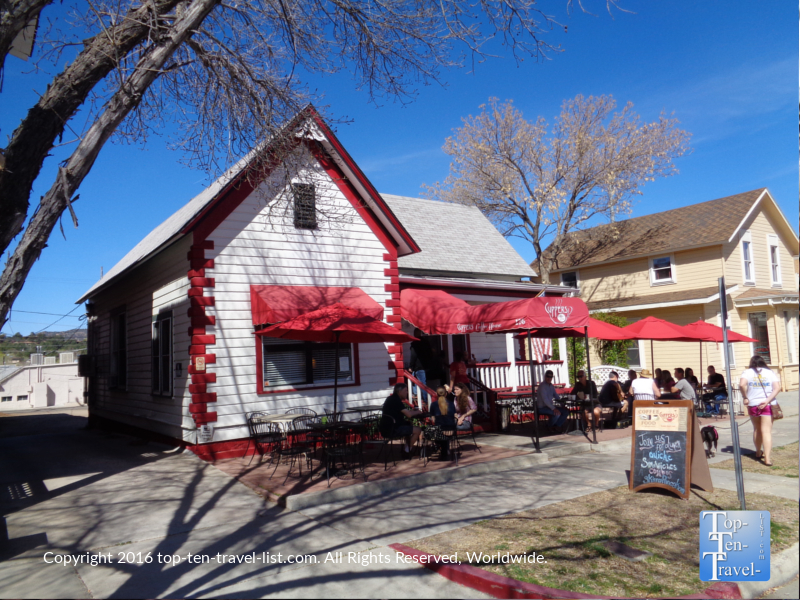 Strawberry is home to the oldest schoolhouse in Arizona, founded in 1885. 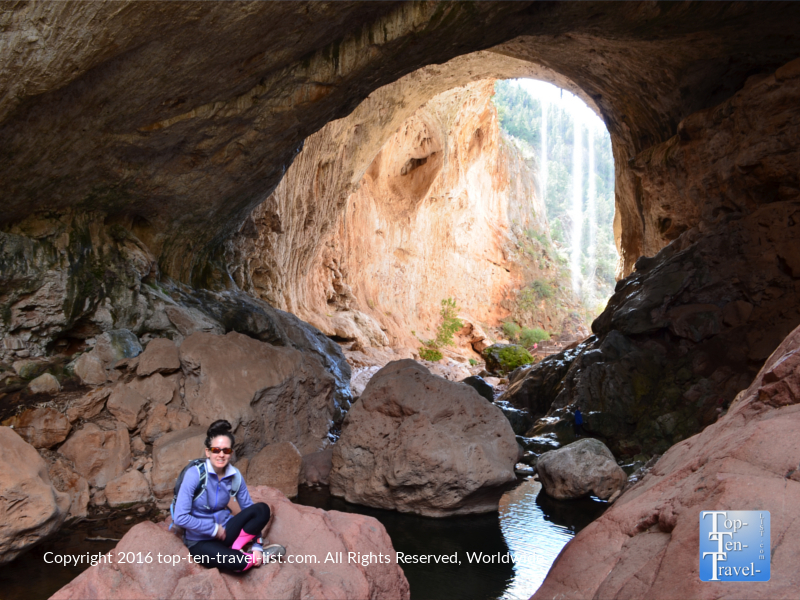 As both areas are surrounded by the Tonto National Forest, there are plenty of trails for outdoor enthusiasts to take advantage of. 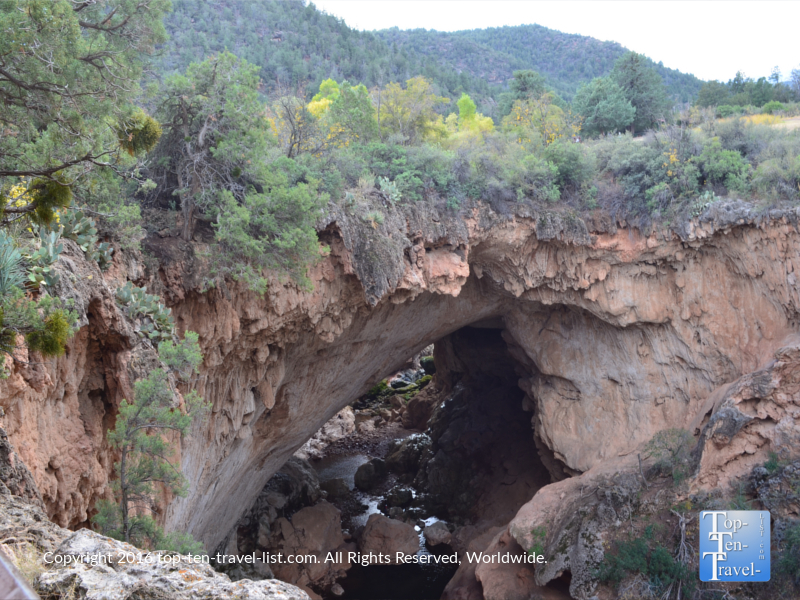 And of course, you must visit the gorgeous Tonto Natural Bridge State park, located just a short drive away in Payson. Enjoy the small town ambiance of these 2 cute towns by renting a rustic cabin in the woods or spend the night in a cozy bed and breakfast. The magnificent waterfall near the end of the Pine trail at Tonto Natural Bridge. This challenging hike involves climbing over various boulders, however, the ending view of the natural bridge & waterfall makes all the hard effort worth it!